Oh no moms! Really? We are flying back home tomorrow? It’s too soon. But, our moms say, yes, our time here is almost over. What to do on our last afternoon and evening? Well, we are surrounded by desert, so let’s go to the desert. 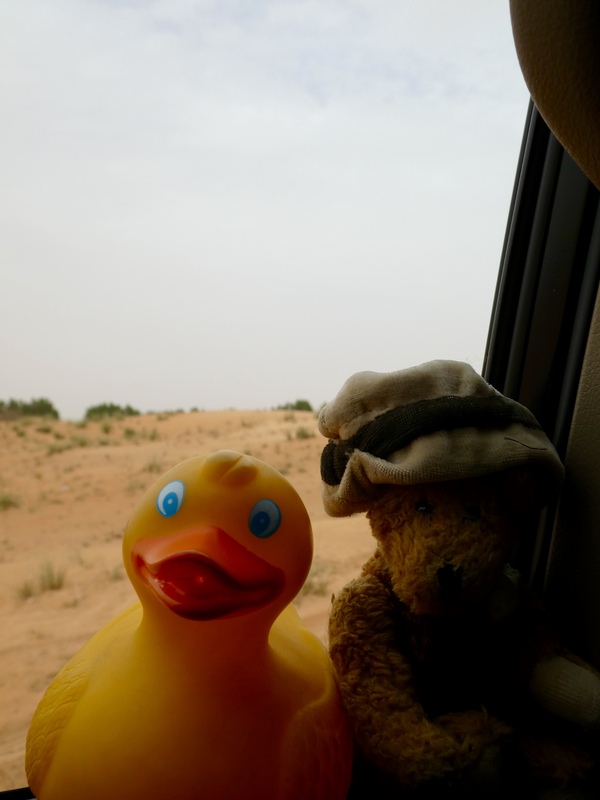 In our tourist vans, looking out the window, Zeb the Duck and Chanel the Bear, watch the desert. Some plant growth here, but lots of sand. 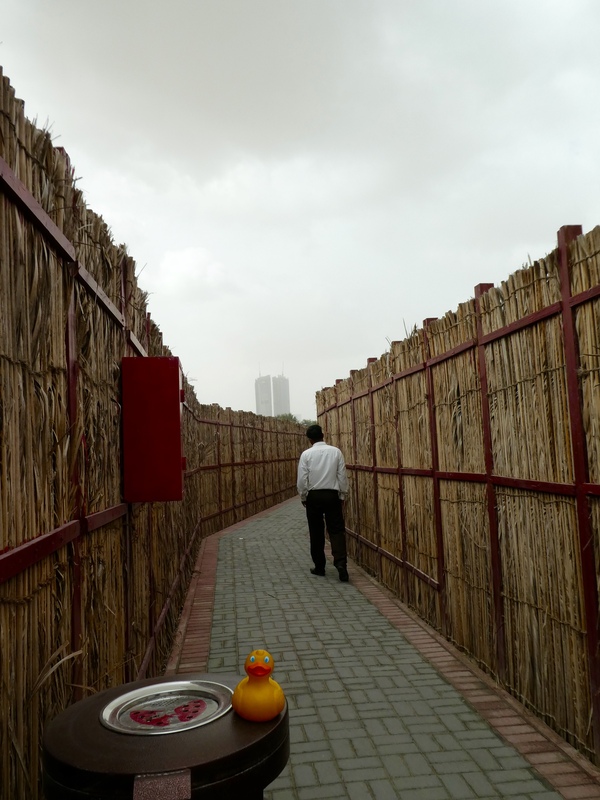 Further from Dubai, the plants are more sparse. Our driver stops the van, slightly deflates the tires, and into the desert we go. No roads here, just hills of sand, or sand dunes. This is a crazy ride and we love it. 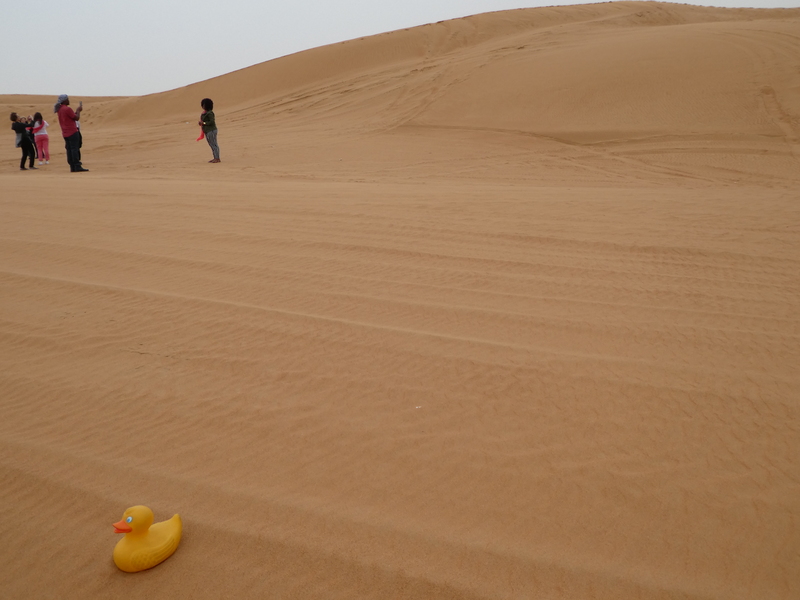 After parking in the sand, the duck, the bear and the humans get out to wander among the sand dunes. It is pretty warm, but this was February, winter in the desert, so it was nice. None of those horribly hot summer days. 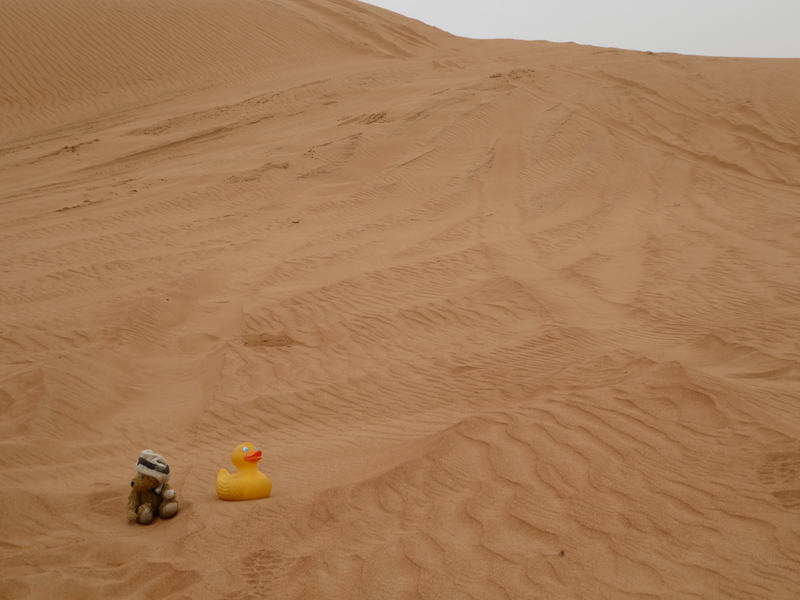 Chanel and Zeb look and feel rather small in the desert. Eventually, back in the 4 wheel drive vans, we continue through the desert, adding a little air to the tires and get on the highway. Wow! Look what is waiting for us. Camels. 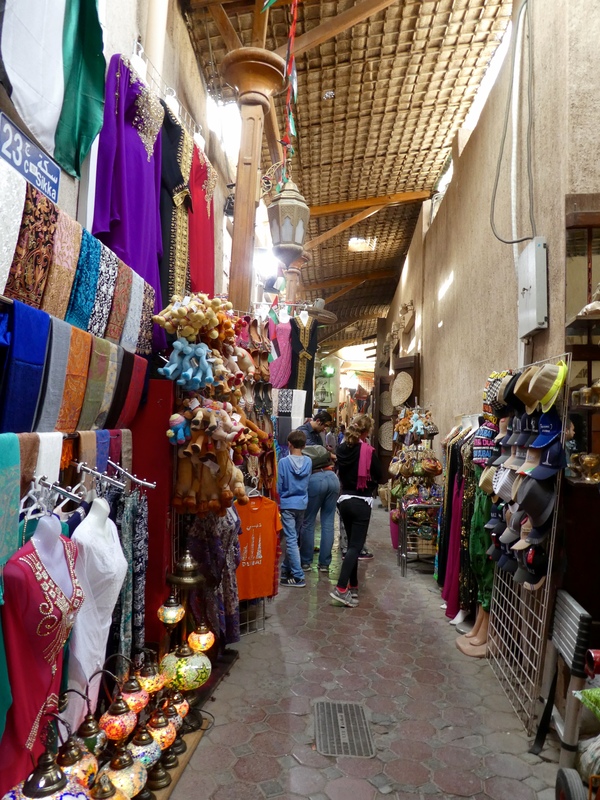 We are going to ride a camel, with our moms, of course. 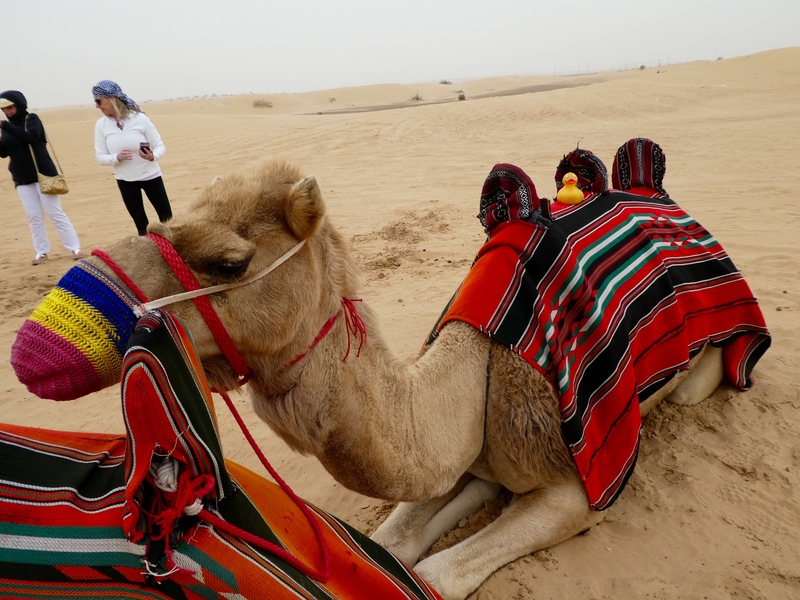 When the camel stands up, we feel like we will fall over the camel’s head and into the sand. But we don’t. We are on the second camel in this photo. Is our camel trying to get closer to a camel friend? Yes, and he does get close. 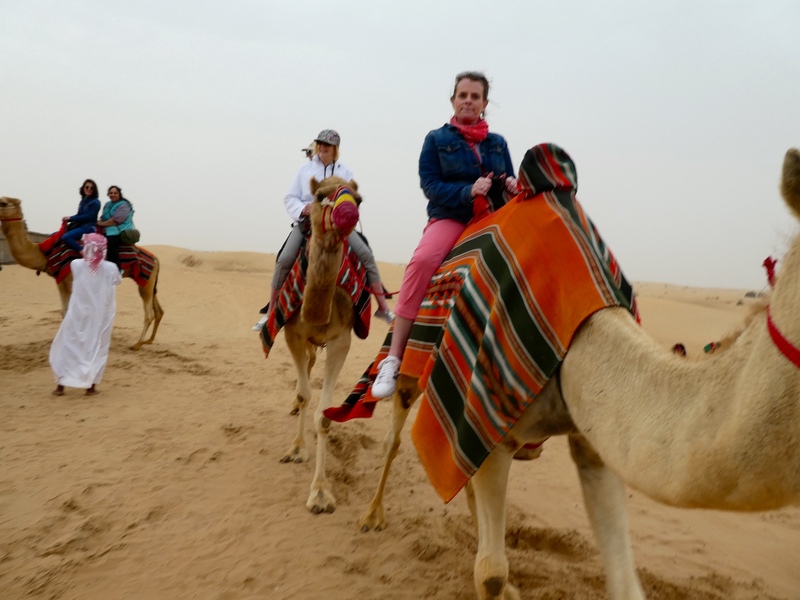 Chanel’s mom even has a bruise on her leg from this camel encounter. But we all have fun. 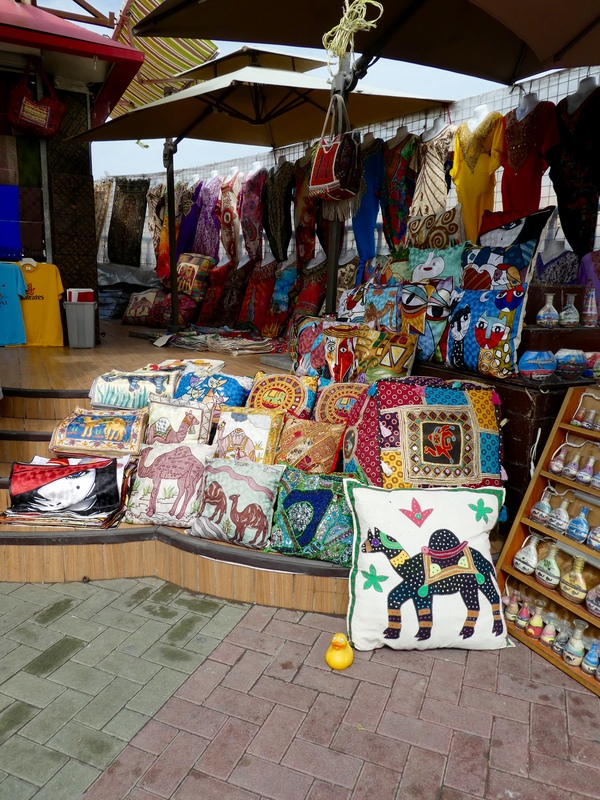 After the camel ride, we progress to the area set for us. These dates are so good. Snacks before dinner. Those dates are delicious! The sweet balls are also wonderful. 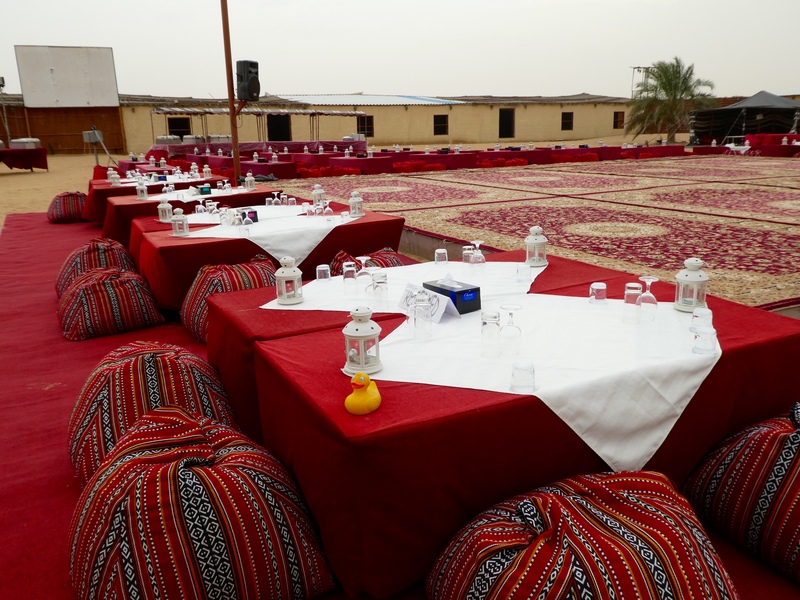 The tables are set for us. We, and other groups of humans, will eat here. Our buffet is to be wonderful. We believe it. All our food has been very good. Before eating, the humans get henna tattoos. A beautiful young Arabian lady applies the tattoos. 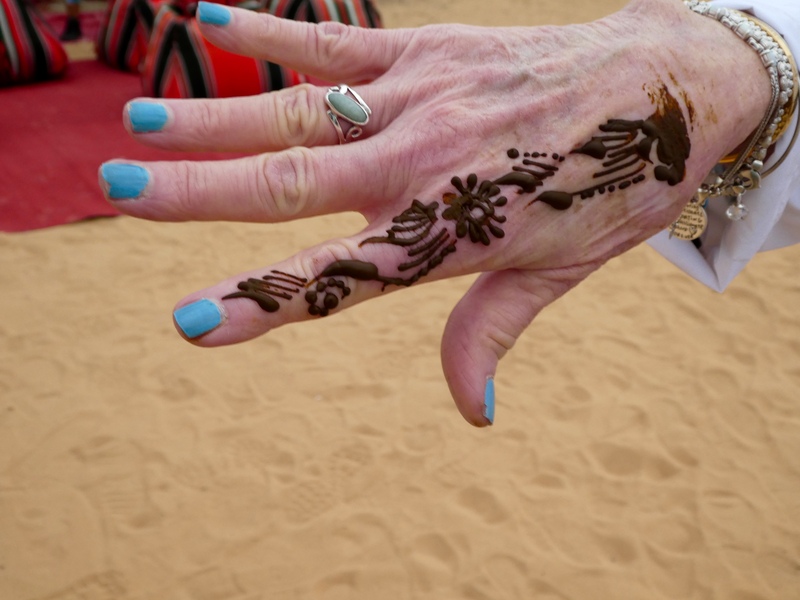 By morning, the raised henna will fall off, leaving the lines on human hands. Those tattoos did look good in the morning. Our moms went home with tattoos! The birds of prey hunt in the desert. This bird will soon fly for us. He has his helmet on. This guy will soon perform for us. He flies fast and sees very well at night. Bird flies and dives. Birds of Prey hunt at night. They are fast. Great carpets here. This bird is putting on a show now, but when free, he will hunt for his dinner. Now it is getting dark. The human entertainers begin. This man twirled very fast and for a very long time. Most humans would get dizzy and fall down, but not this man. 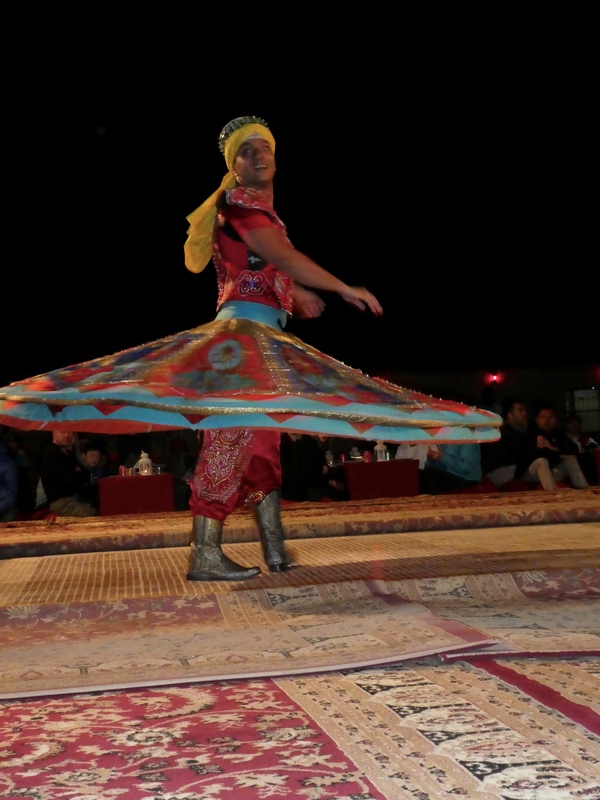 While twirling, he unwraps yards of cloth making different, flowing articles of clothing. Next the female dancer begins to dance, with her cape flying in the wind. Since it is now dark, the photography is finished. After the dancers, the buffet lines begin. Everything was so tasty and good. 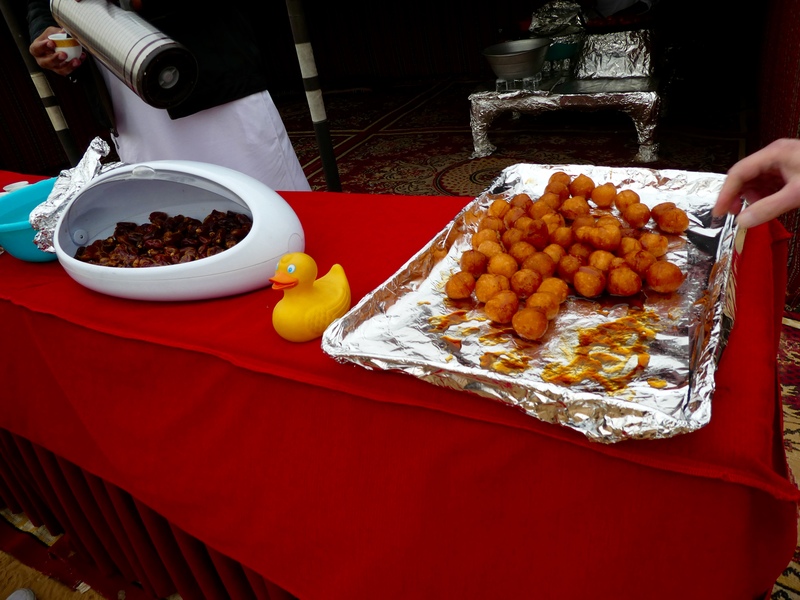 And there was a lot of different foods to try. And we sampled many things. After the buffet, more entertainment and then our drive back to Dubai and the Hyatt Regency. A wonderful ending to a wonderful trip. As a Colorado Traveling Duck, I am always happy to see other birds. 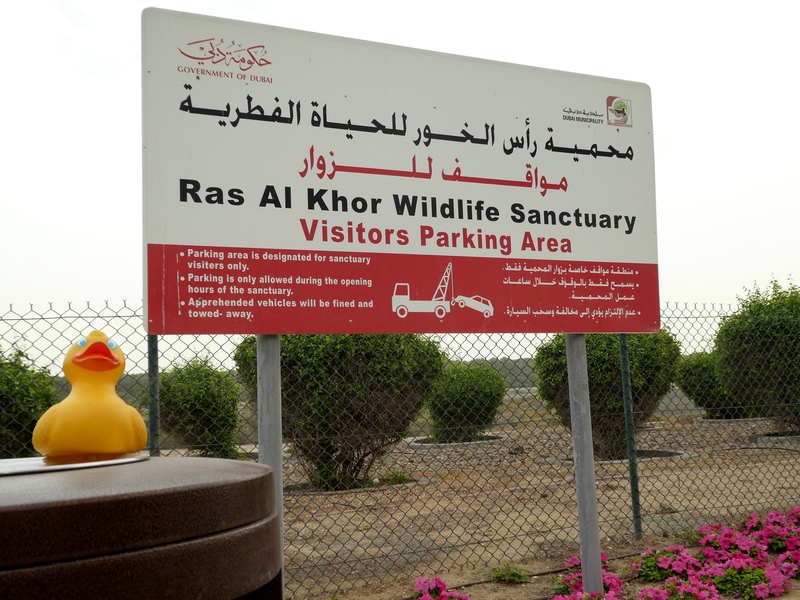 I took mom to Ras Al Khor Wildlife Sanctuary to see the migratory pink flamingos that spend the winter in Dubai. Here we are. The tide is out, so the flamingos rest rather far from us. Let’s follow the path to see them. 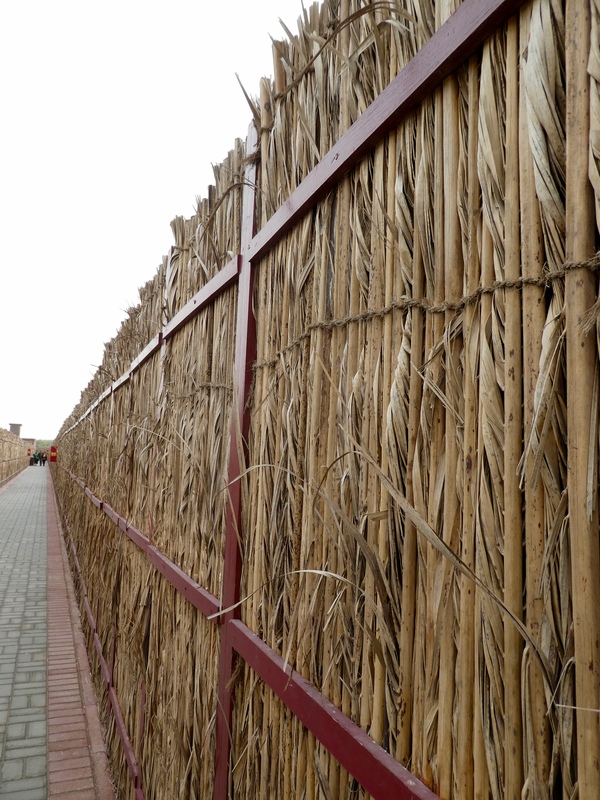 Walls are made of palm fronds. Isn’t that so tropical? What? The Flamingo Hide? 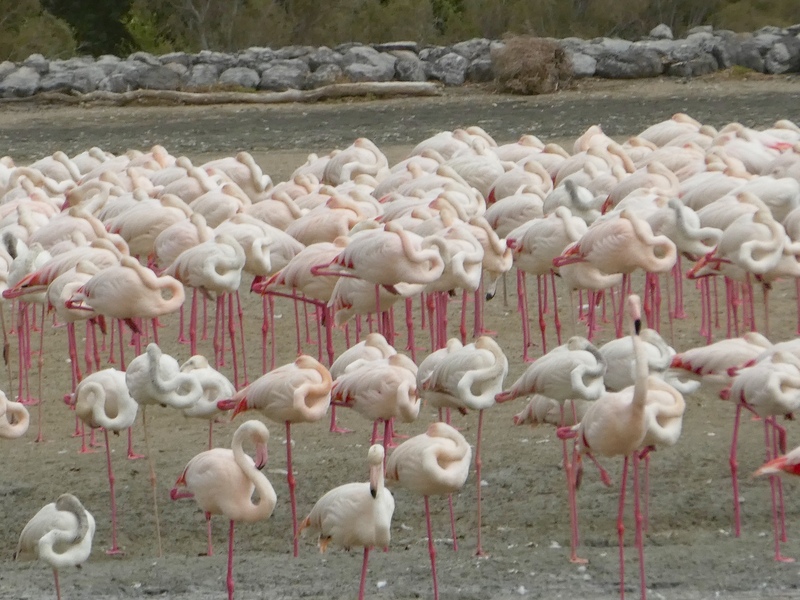 Oh, we call this a flamingo blind, where we watch the beautiful pink flamingos without frightening them. 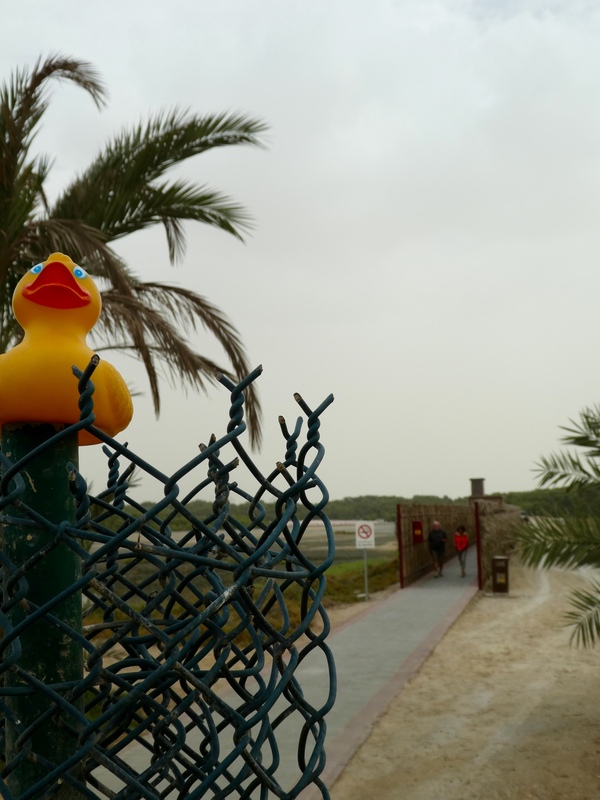 Hundreds of fellow birds waiting to meet me, Zeb the Duck. Many flamingos sleep; they do not seem comfortable with twisted necks, but that is how they rest. 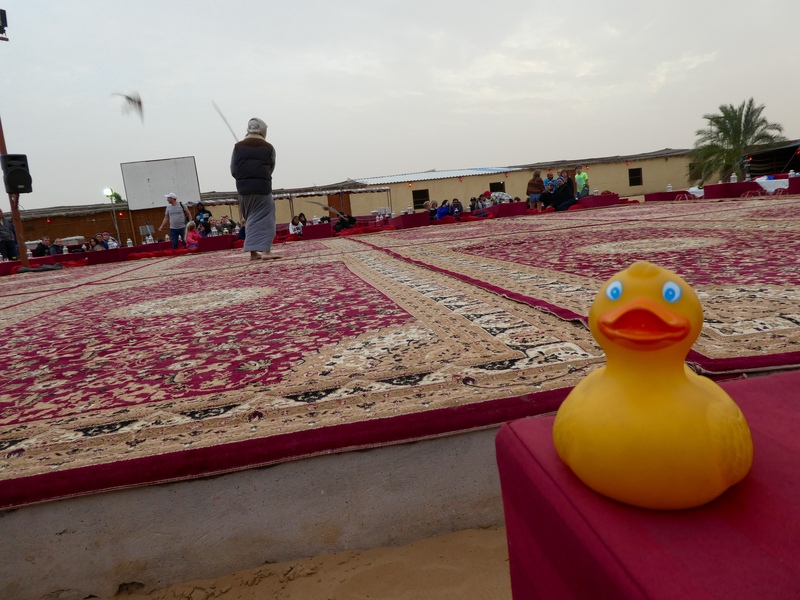 Some finished napping and with heads up acknowledge the human and duck visitors. After much watching, photographs and binocular time, we follow our driver back down the path. 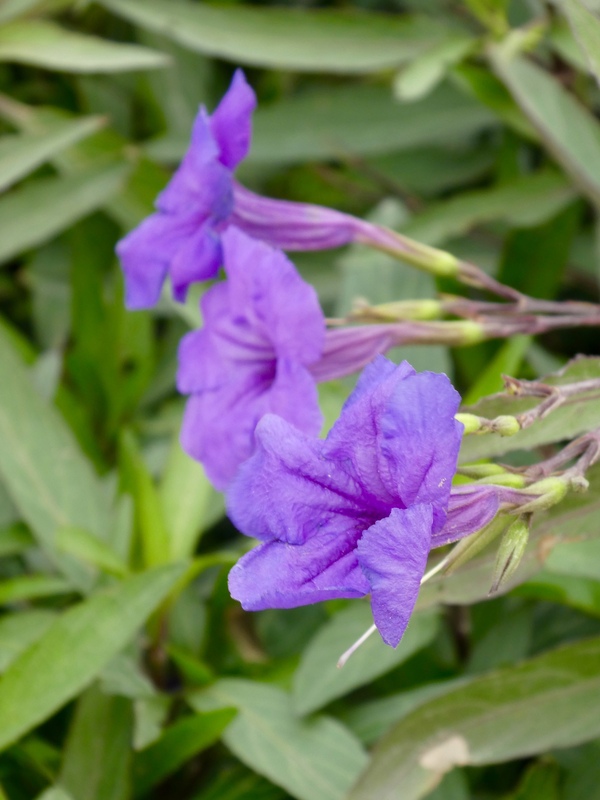 Pretty purple flowers grabbed our attention as we approached the car. Pretty flowers. 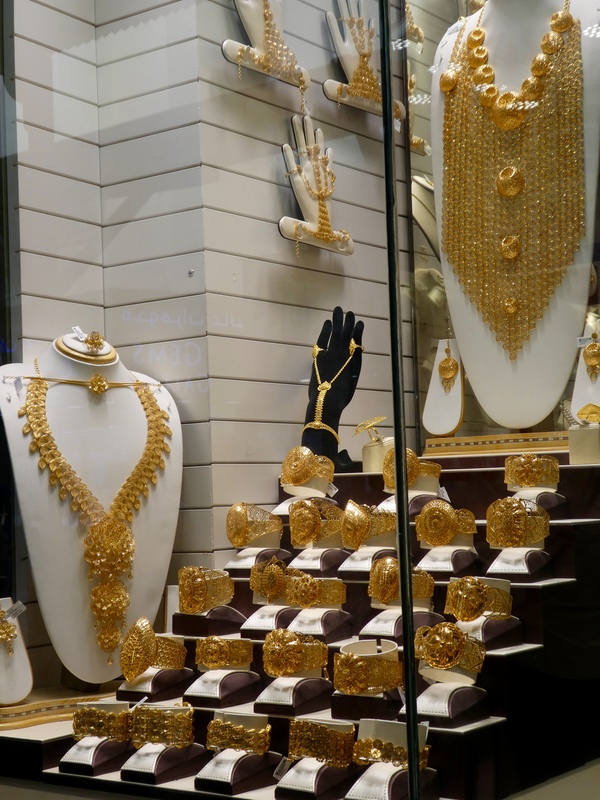 And in the desert climate of Dubai. 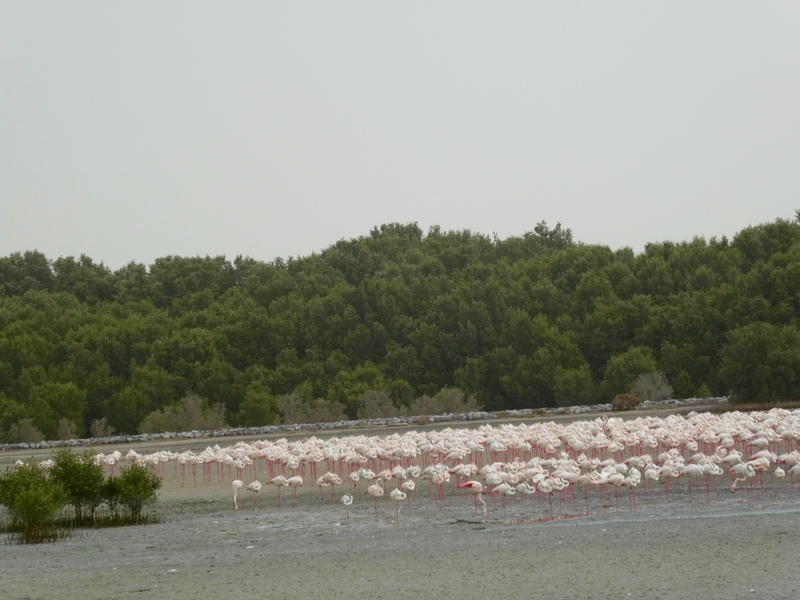 The flamingos spend the winter very close to downtown Dubai. Through the haze, blowing sand, and ever present construction cranes, we view the many skyscrapers of downtown. 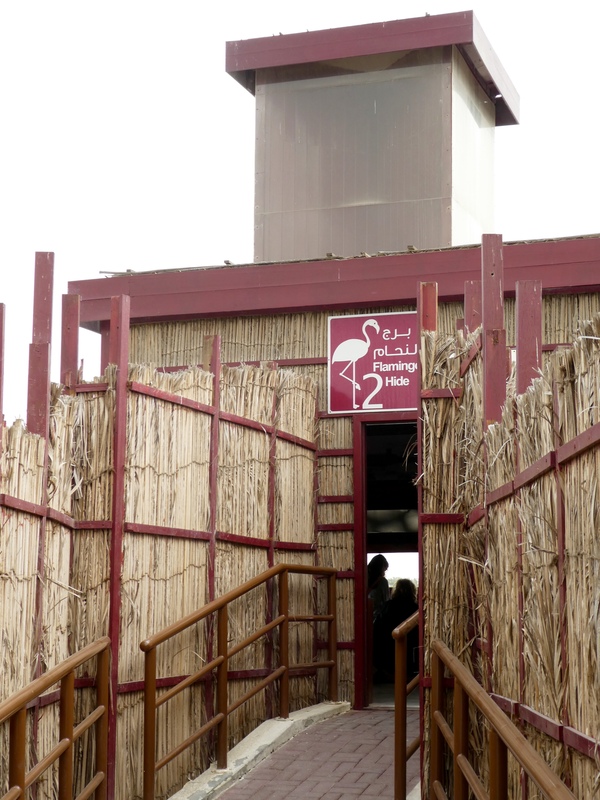 We believe there is a plan for building near the flamingos, to protect the winter visits of flamingos, and continue the development of Dubai. As a duck, I am concerned about all birds, but I have a faith in everything working out well. What do you think? 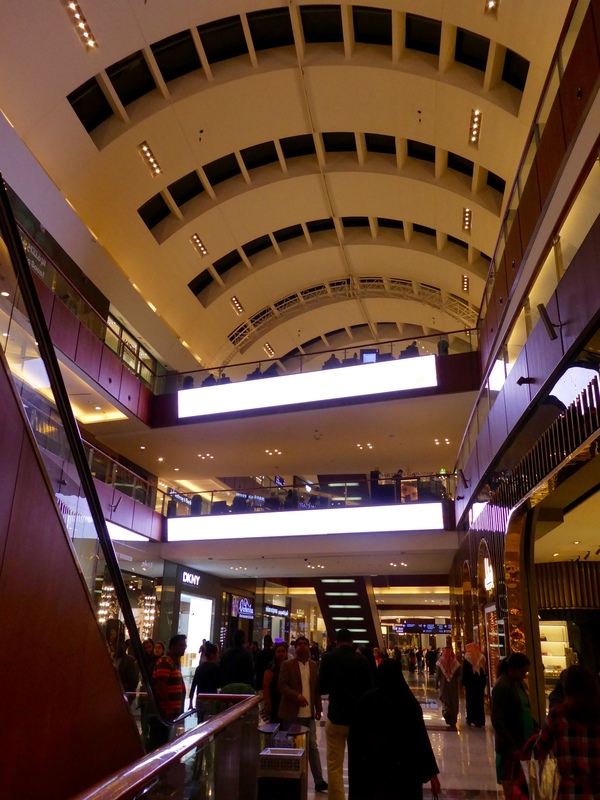 November 2005, Mall of the Emirates opened in Dubai. It was huge, it was exciting and it was new. 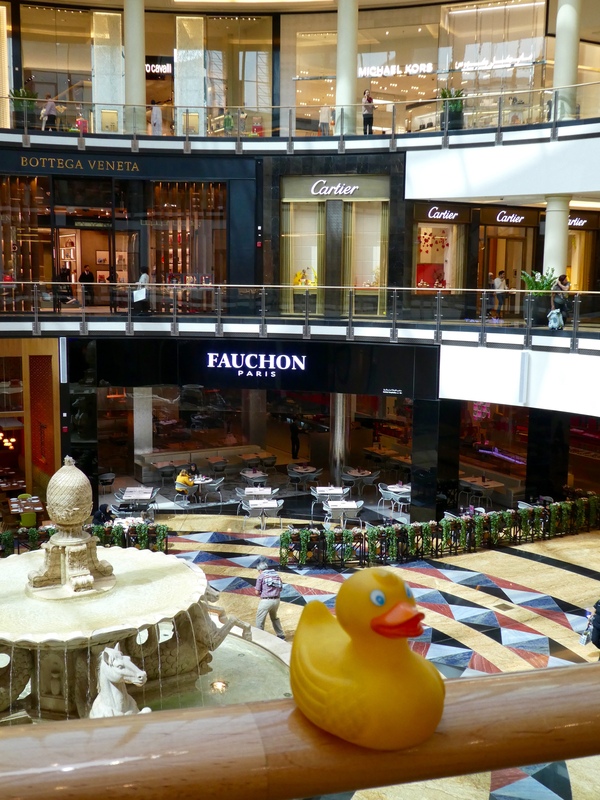 Zeb the Duck and Chanel the Bear explored this mall. It is beautiful. 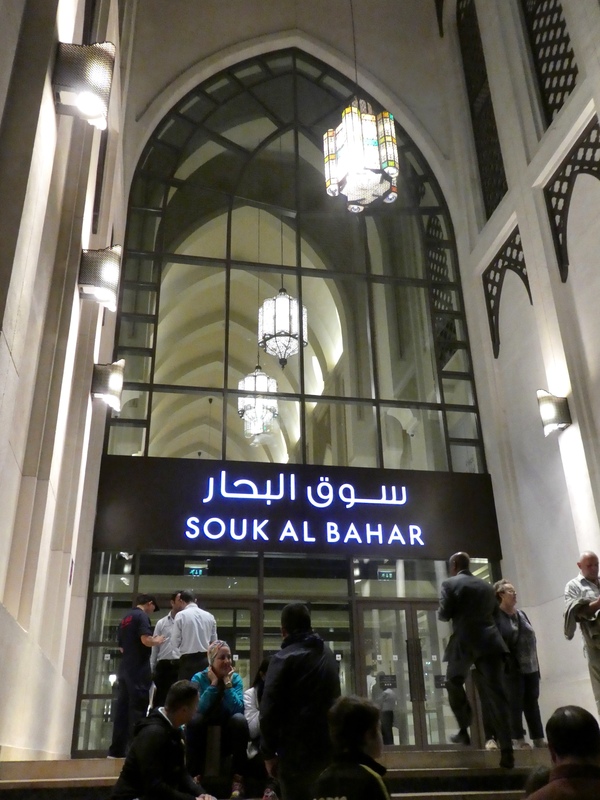 In the 12 years since it open, Mall of the Emirates has added something. 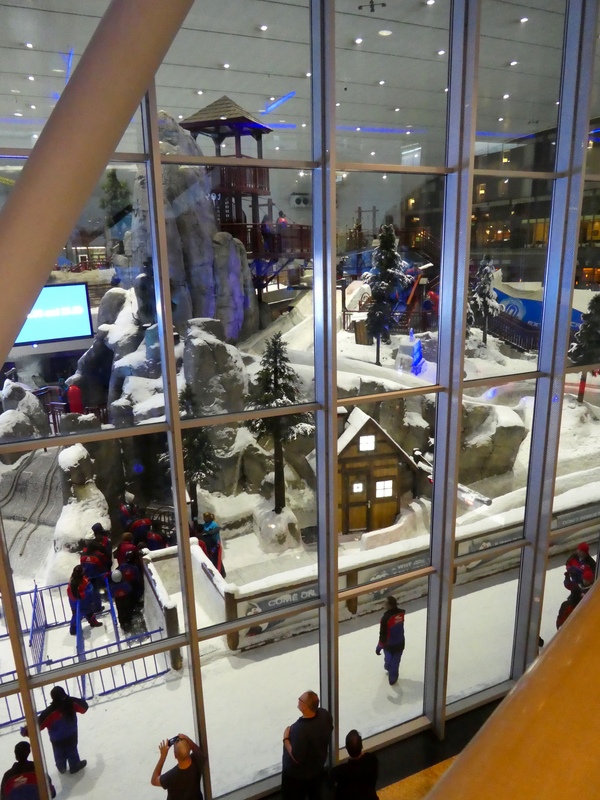 Ski Dubai, a real indoor ski area is inside this mall. This is not a cute model snow village. This is life size and humans play inside. 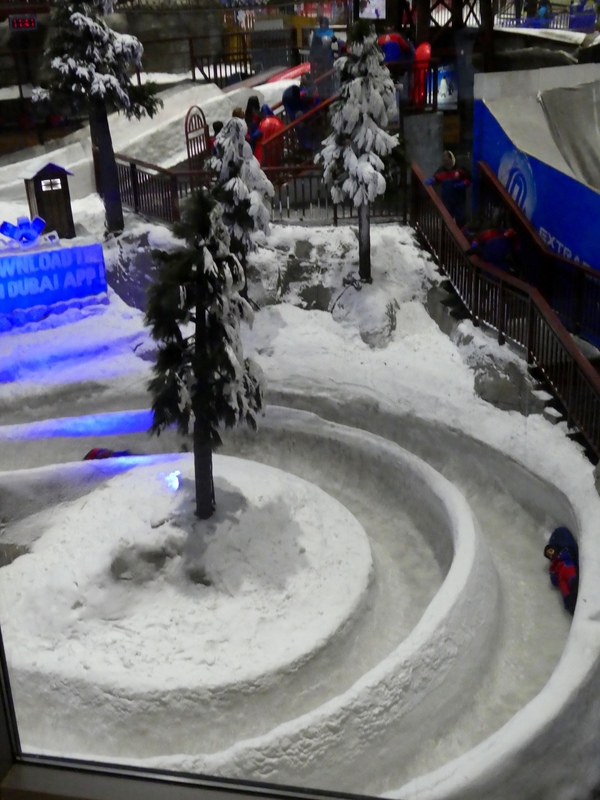 Here is part of the track for riding on sleds, similar to the luge. 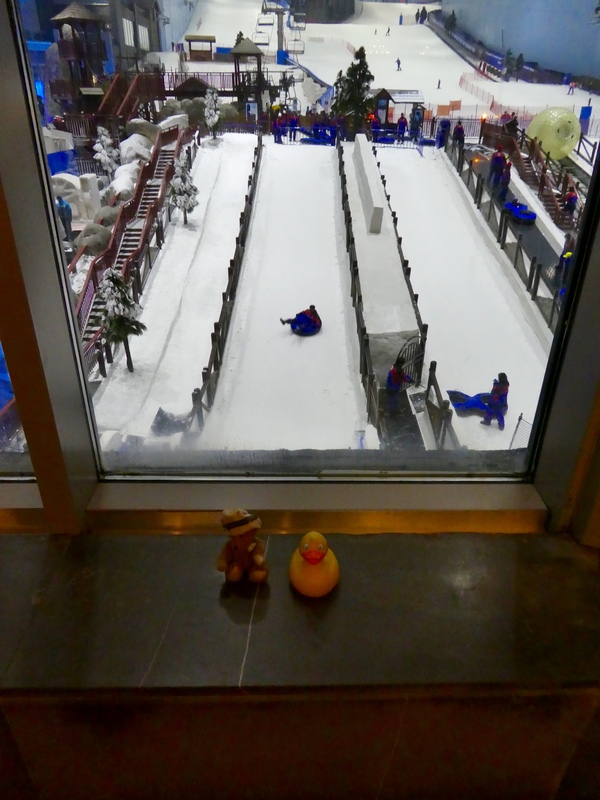 We, Zeb the Duck, and Chanel the Bear, are watching skiers at the top of the photo and other humans enjoying the tubing hill at the bottom of the photo. These huge balls are fun. Humans get inside and down the hill they go. Also here, but not visible from the windows, is a penguin encounter. Real penguins are inside and humans see them and learn about them, and then humans can touch and hug the penguins. Imagine–penguins in the desert. This mall has three levels with over 700 stores. 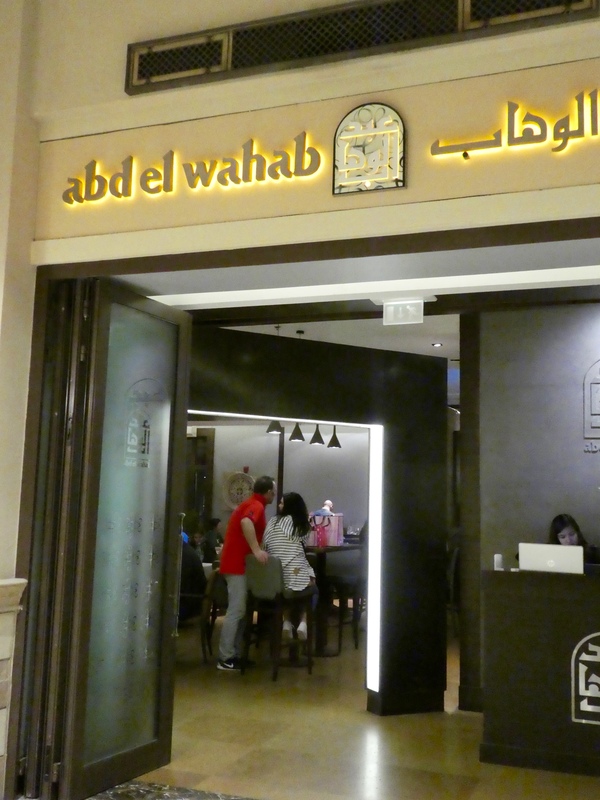 Inside the Mall of the Emirates there are several restaurants and cafes. We really liked the outside wall of Hollister of California. This a surfing video and you can watch the surfers actually surf. We liked it a lot. 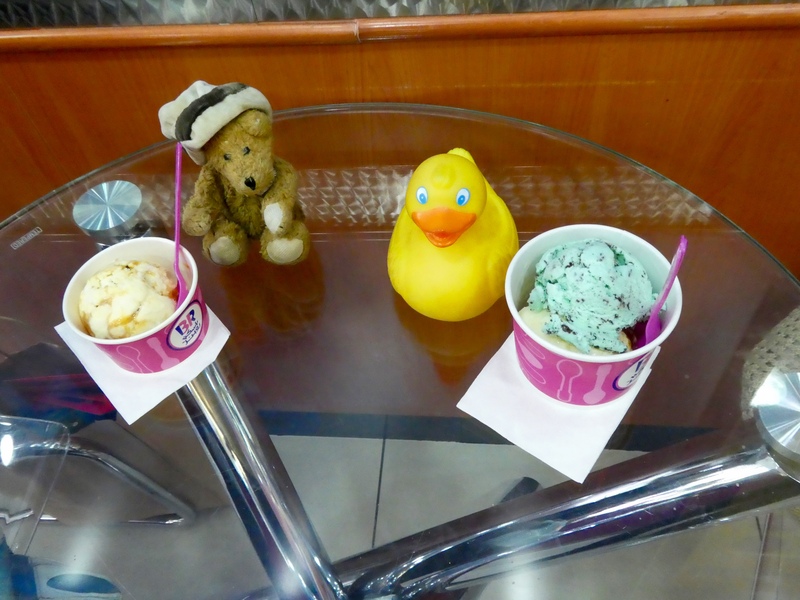 As always, shopping and looking makes the humans, duck and bear hungry. In the Cafe Moritz, we had a table by the window looking into the ski area. It was fun to see humans skiing. 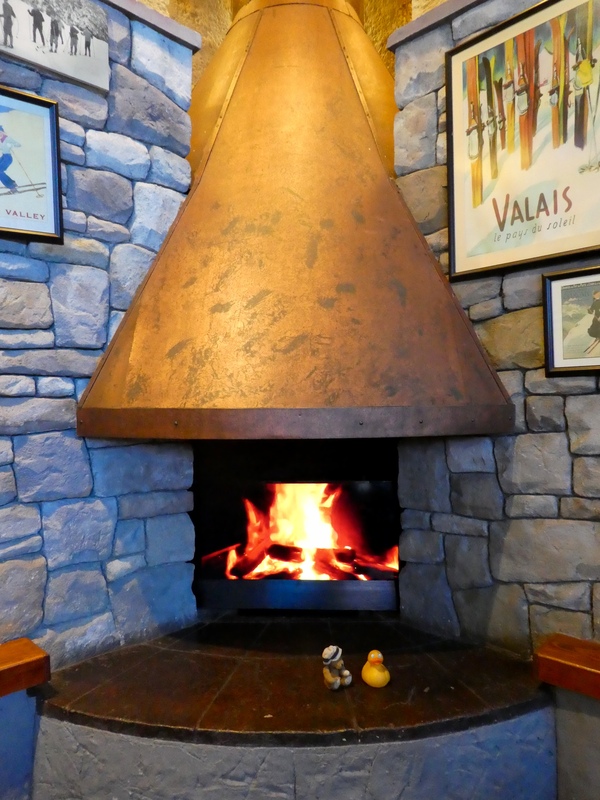 And, to add to the skiing atmosphere, we really enjoyed this fireplace. This mall also has theaters and Magic Planet. 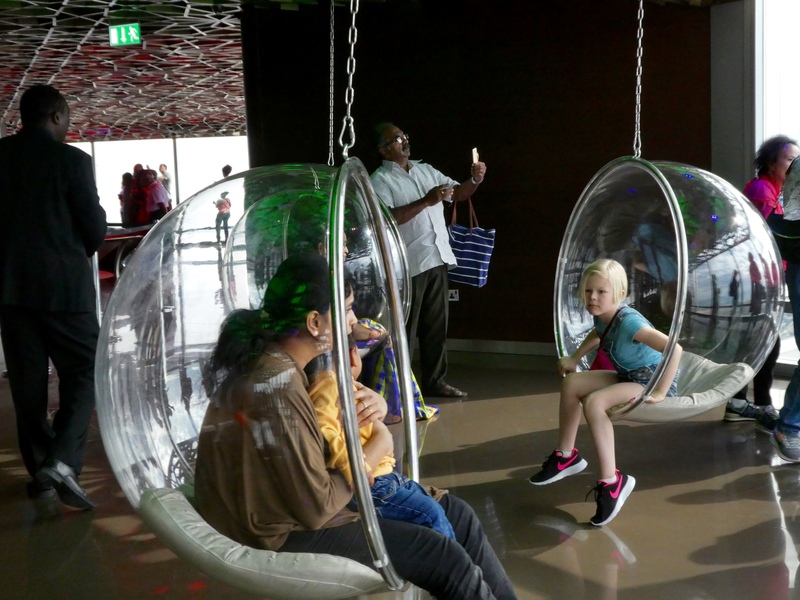 Magic Planet is the largest indoor family interment center in Dubai. 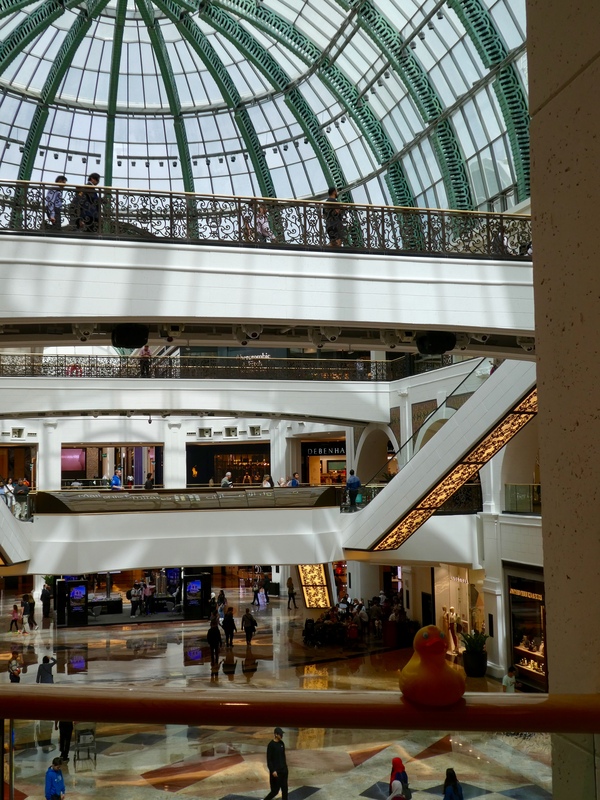 This mall is fun for tourists like us, but if we lived here, we would probably be here a lot during the extremely hot summer months. 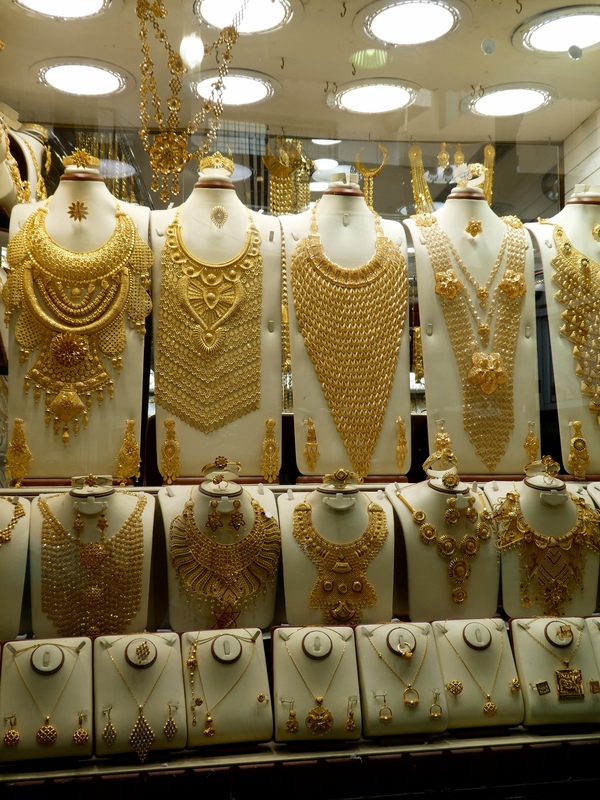 Dubai certainly has many attractions to offer. 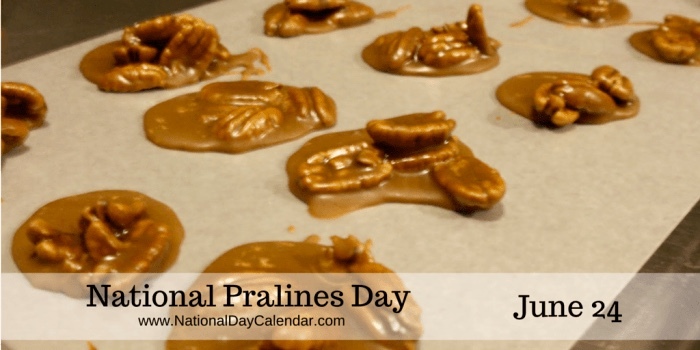 Today, June 24 is National Praline Day. We wish you a very sweet day. 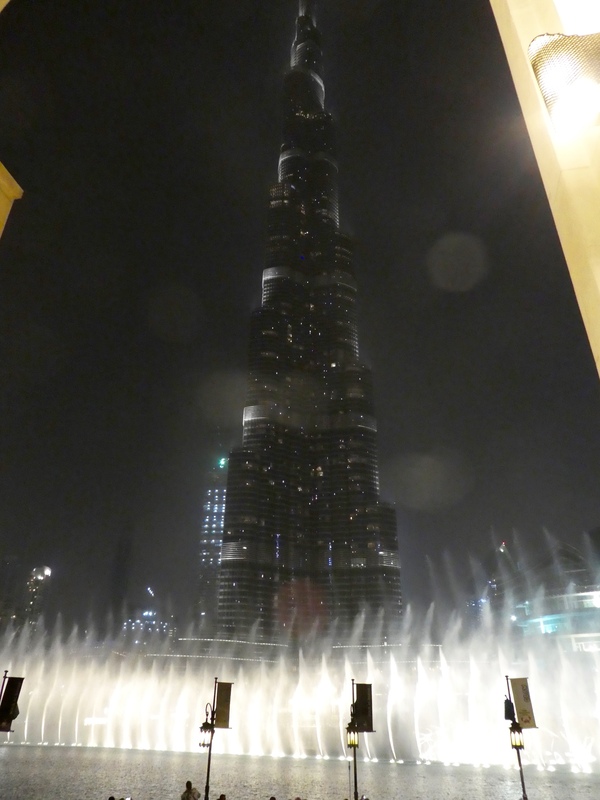 From Dubai Mall, the largest mall, in area, in the world, we visited the world’s tallest building, Burj Khalifa. Through the mall, near the lower level food court, we joined the line to take the elevator to the observation deck. 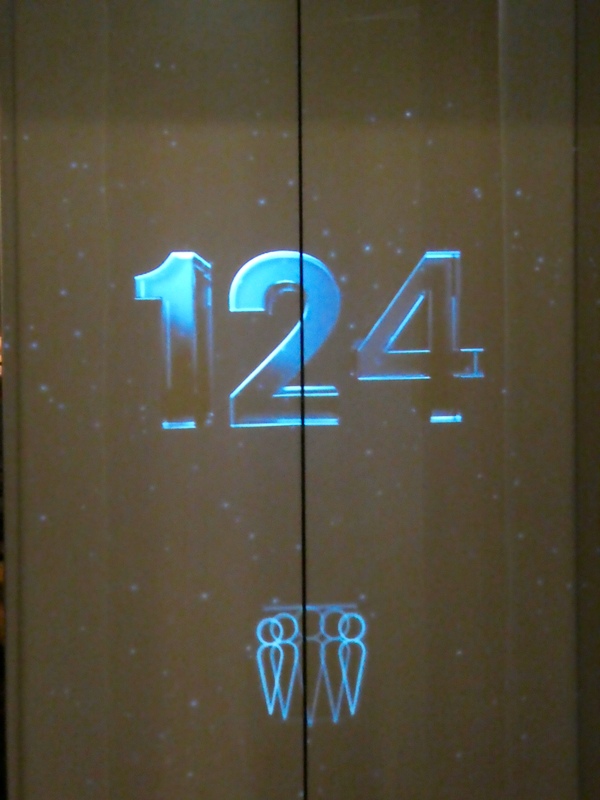 The elevator stopped at Level 124. The largest observation deck is on levels 124 and 125 with a spiral staircase connecting the two levels. 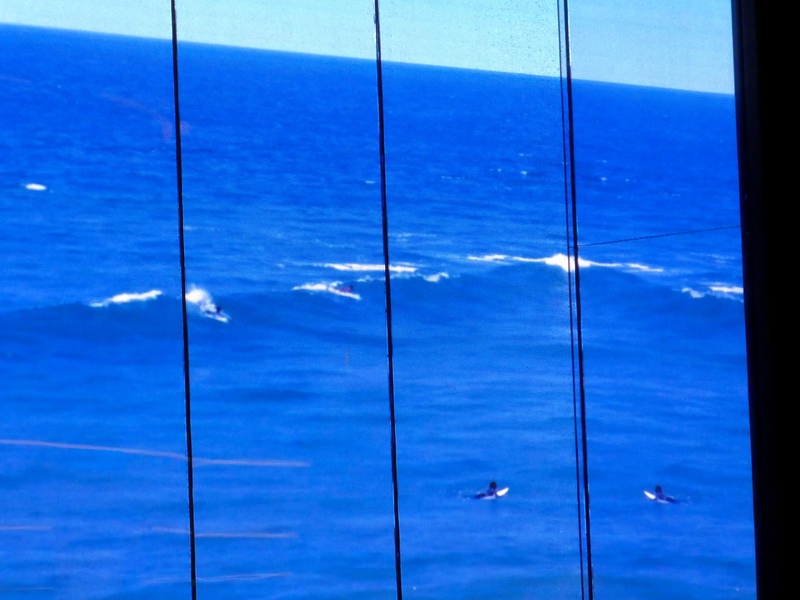 Some of our favorite photos, through glass, from the observation deck. 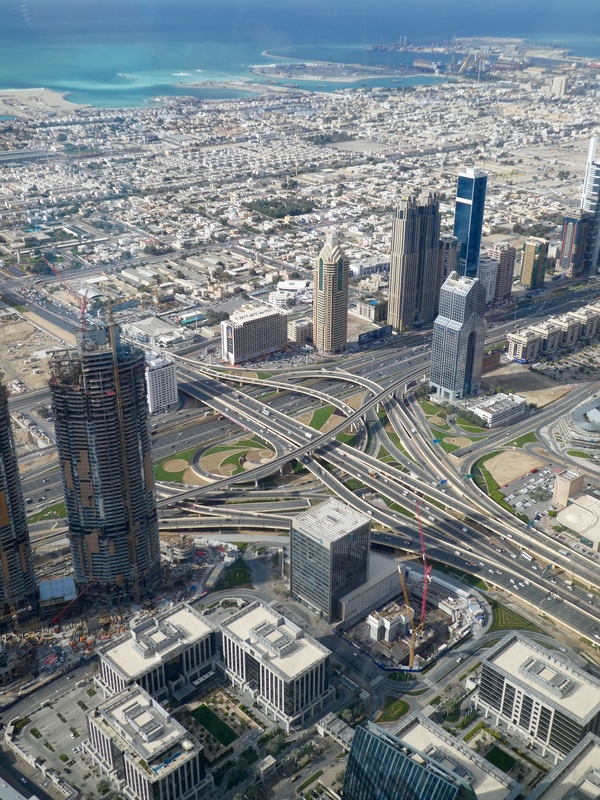 Very impressive highway system in Dubai. And another direction. 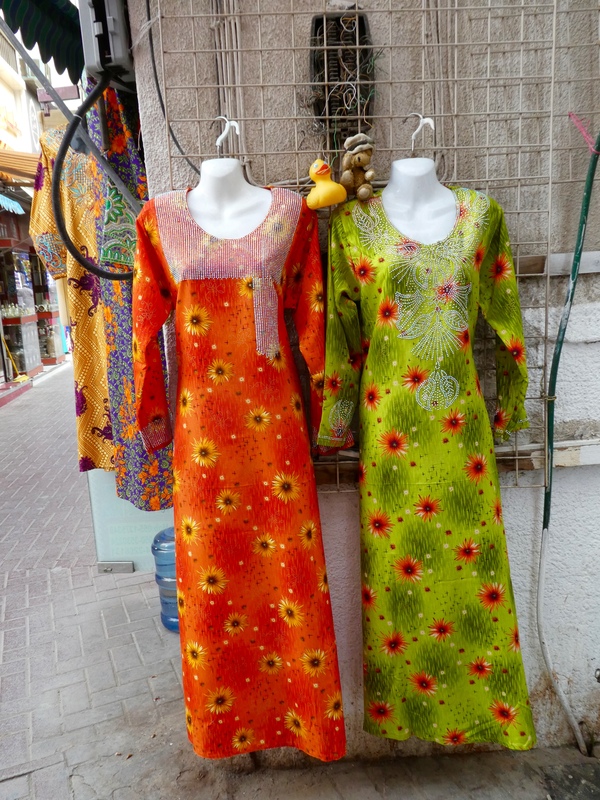 Dubai is located on the Persian Gulf, near the meeting of the Arabian Sea. 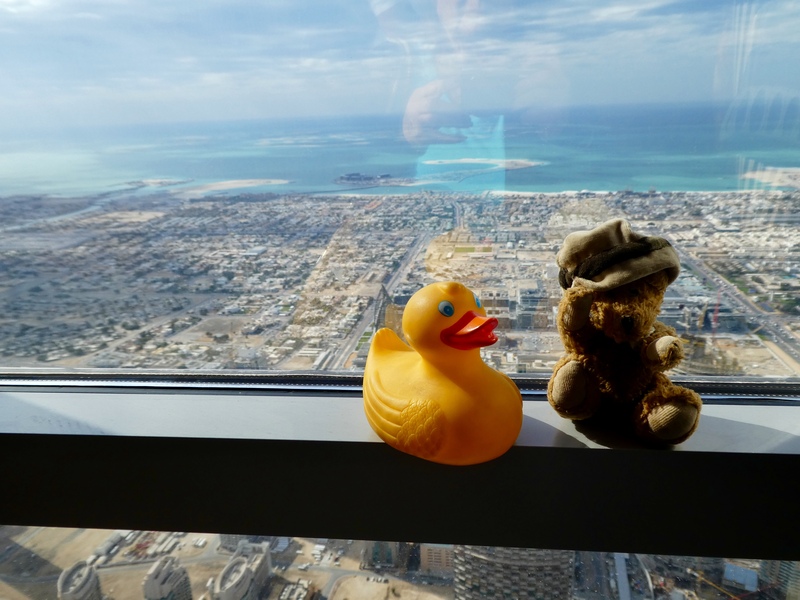 Zeb the Duck and Chanel the Bear look out. Is this almost the top of the world? Some pretty heavy clouds up here. Humans, especially young humans, like to sit in unusual chairs. We like these chairs. 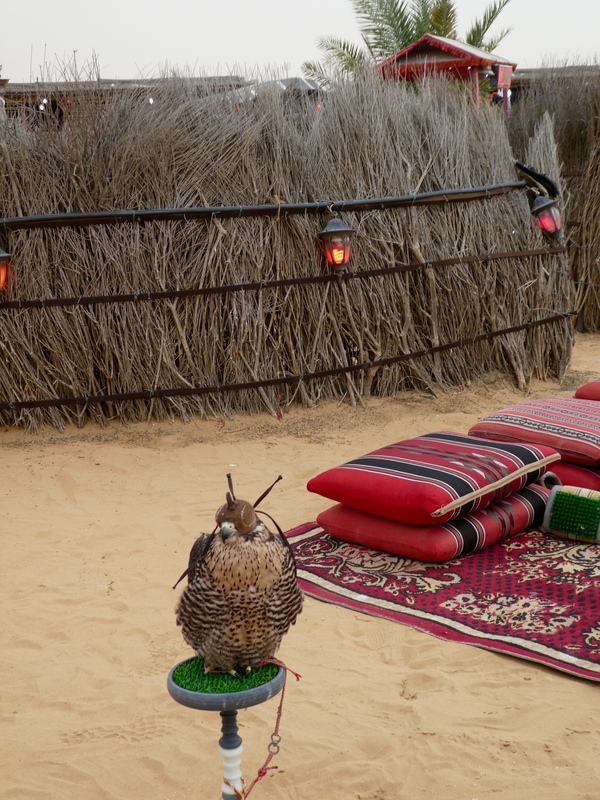 Yes, Dubai really is in the desert. Sand in the distance. Let’s look straight down. 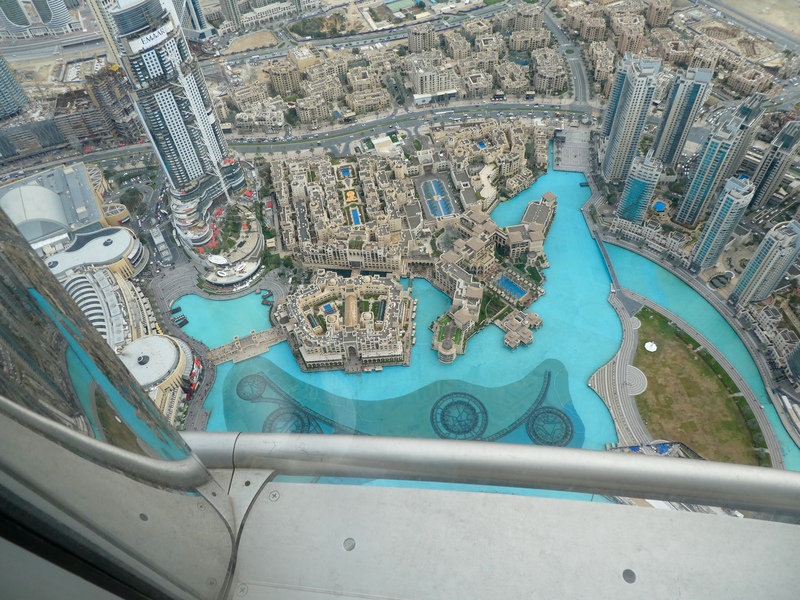 Burj Khalifa has 4 pools, in additional to lounges and health and wellness facilities. More proof that the desert was here before the city. 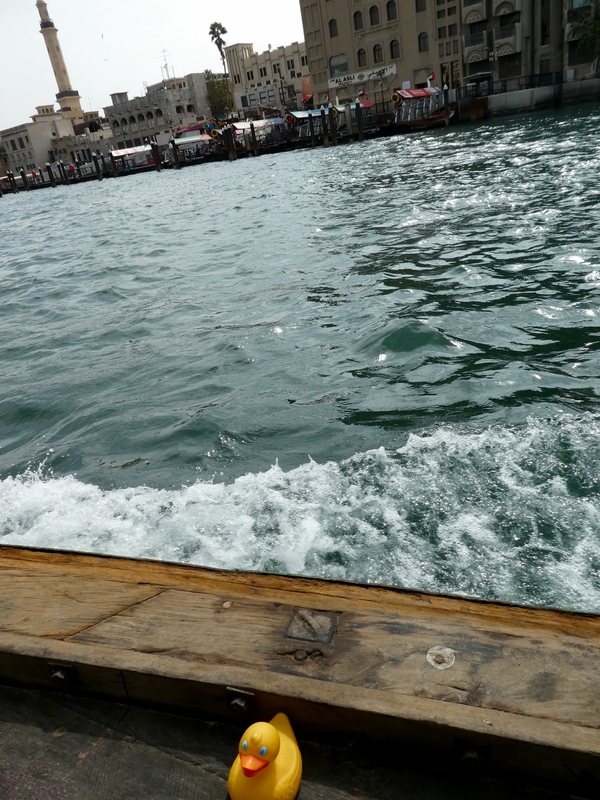 You can imagine the view of the Dubai Fountain water show from here. 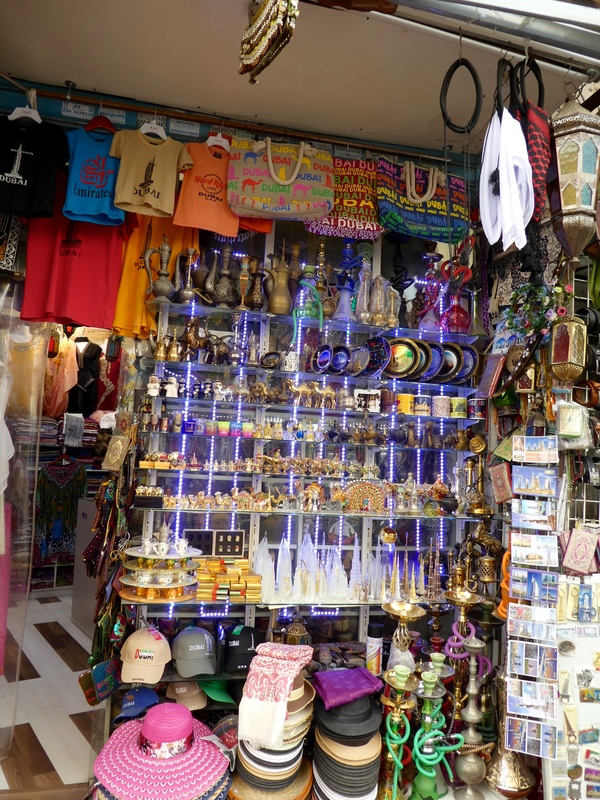 Burj Khalifa contains retail space and office space. 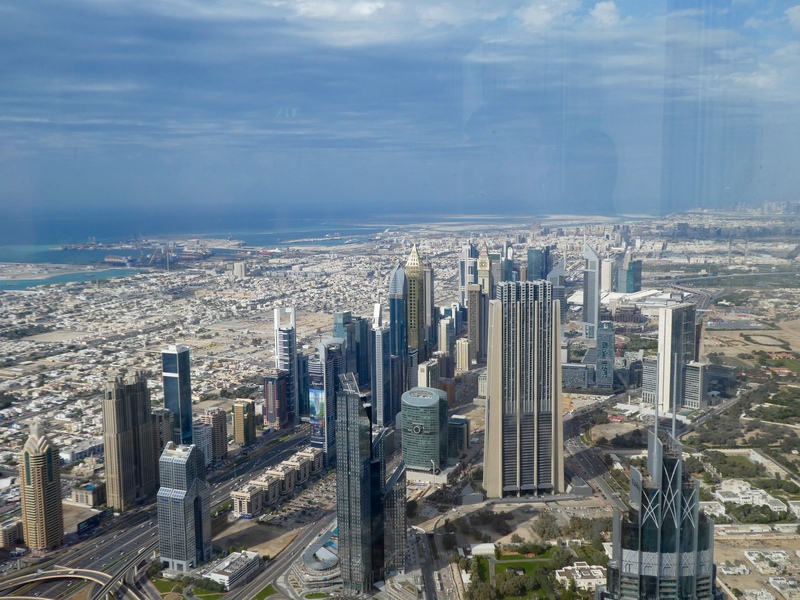 The Armani Hotel Dubai and Armani Residences are also housed in Burj Khalifa. 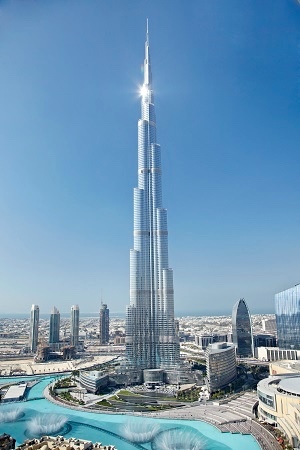 The world’s tallest building is 2,716.5 feet or 828 meters tall. 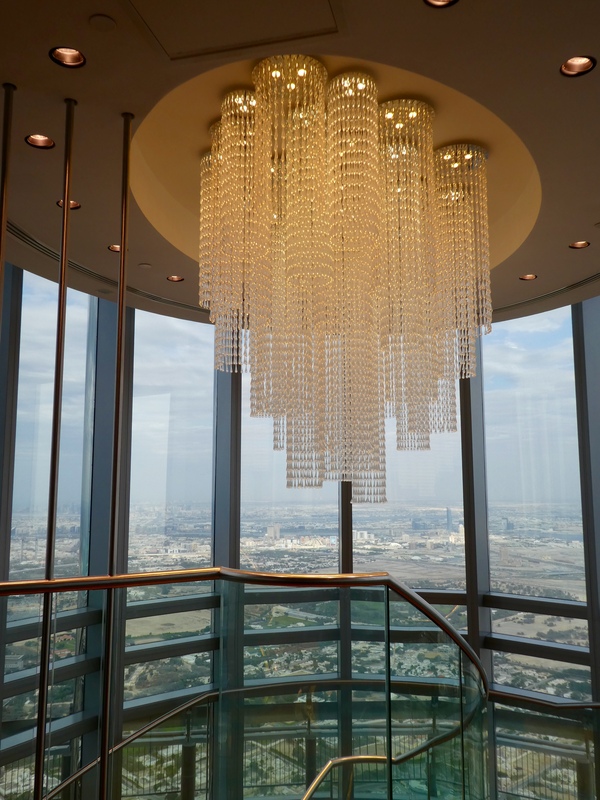 In the lobby area of the observation deck is this stunning chandelier. 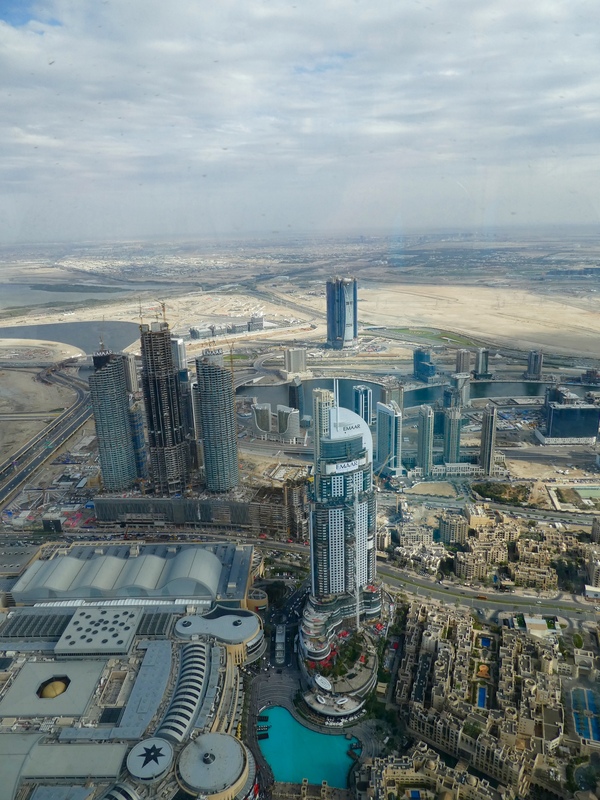 In addition to the other world records, Burj Khalifa boasts the highest library on level 123. The world records are nice, but the views are better. 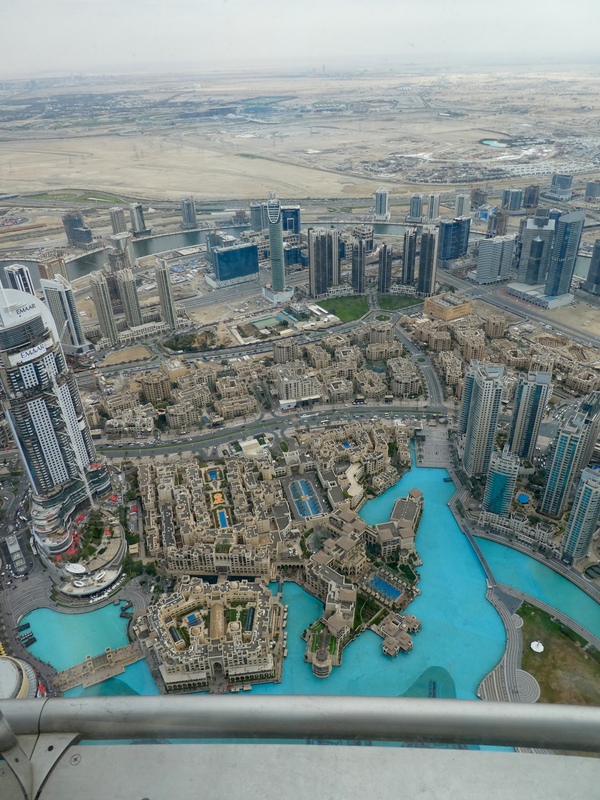 When in Dubai, we suggest you visit Burj Khalifa’s observation deck. 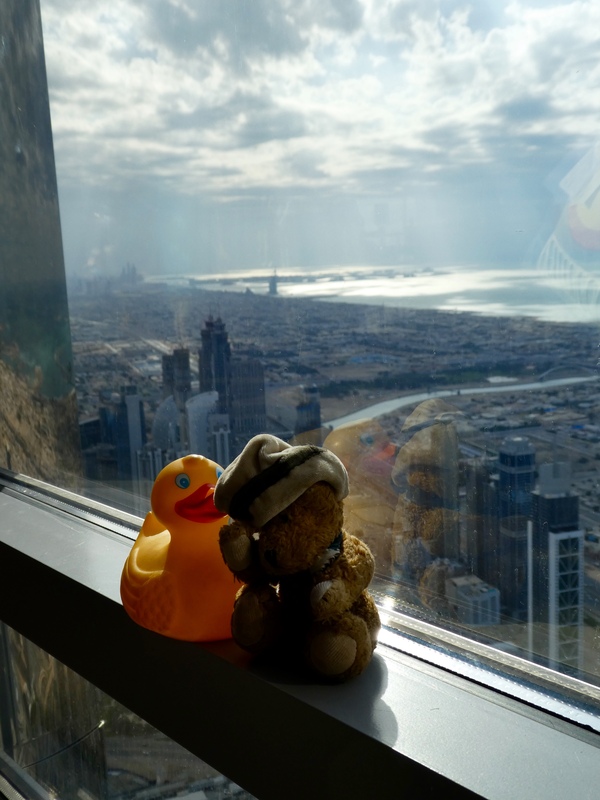 We, humans, duck and bear were very happy we did. 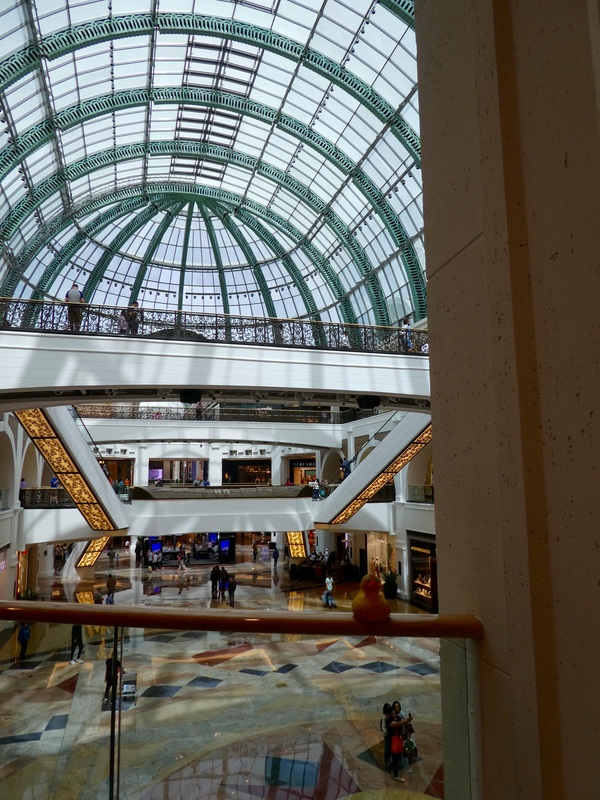 Dubai Mall is the largest mall, by area, in the world and we are here. 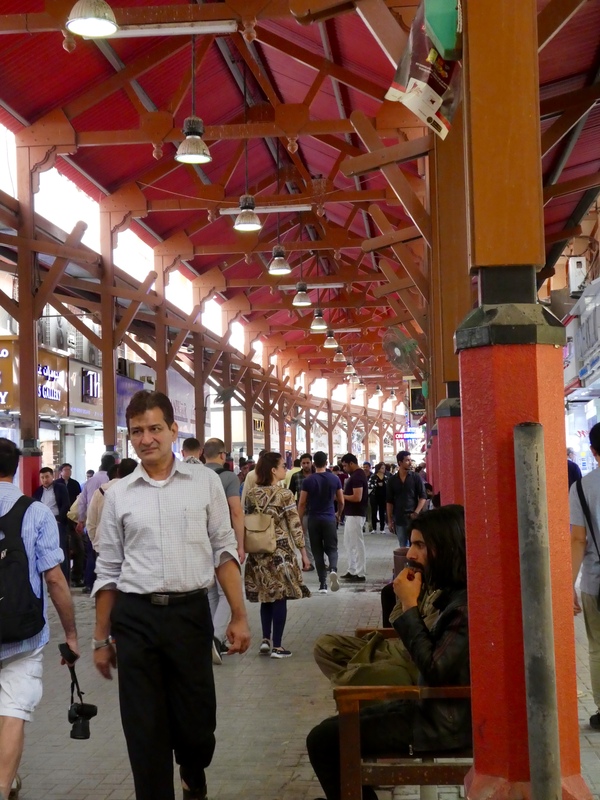 Over 1,200 shops, over 120 restaurant and cafes and 22 cinema screens wait for us. But, not only us. 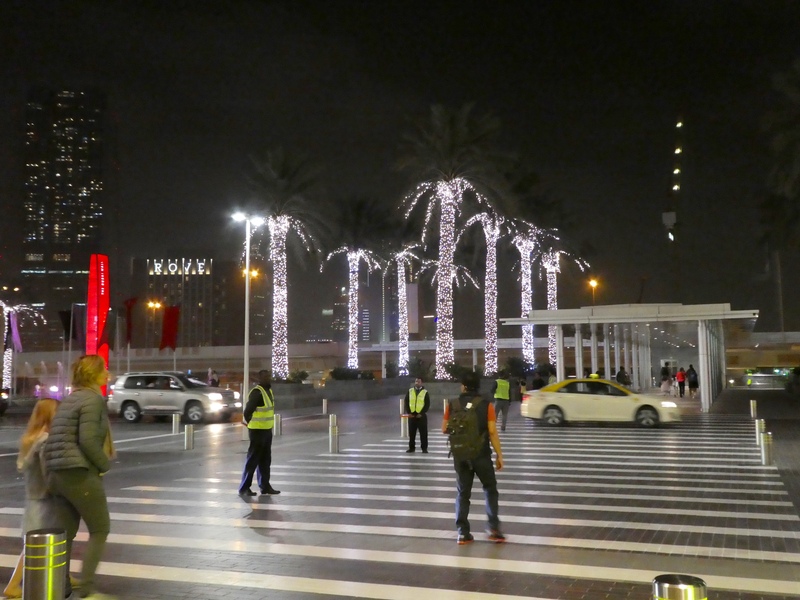 This mall needs humans to control the traffic here. But, we want to see what will greet us when we go inside. This wall of wall is gorgeous, and all this water in the desert. We are in Waterfall Atrium. 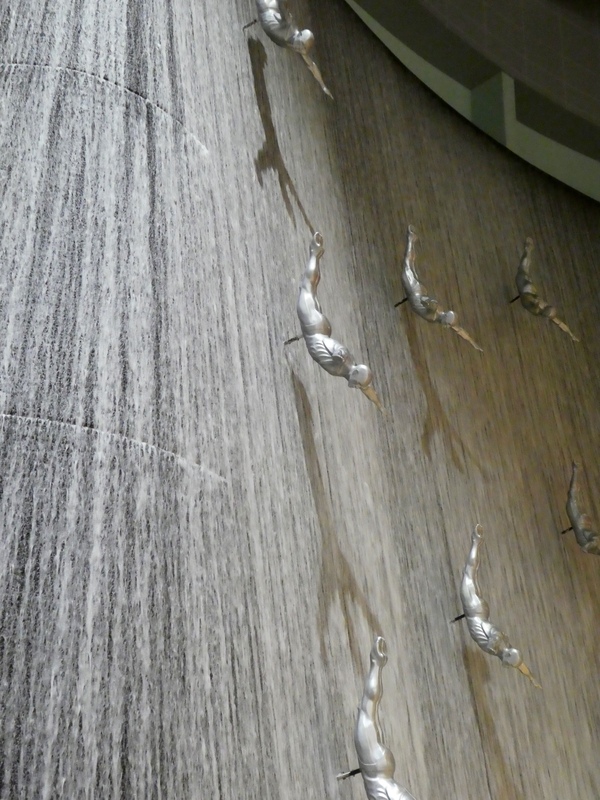 Just look at those divers. Here is the Quicksilver store. 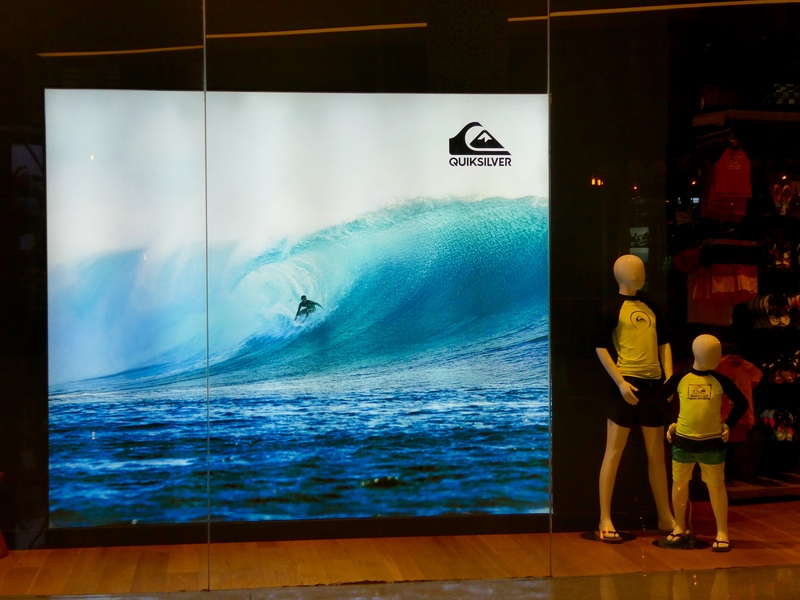 We have these stores at home, but we have never seen a surfing video of surfers near the entrance of Quicksilver. We, and most American shoppers, love Bloomingdales. 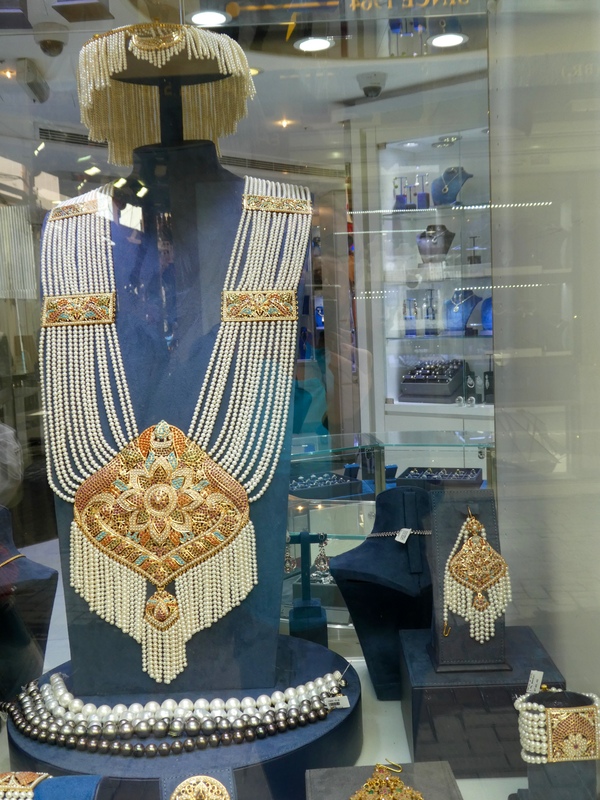 Many Dubai shoppers also love Bloomies. 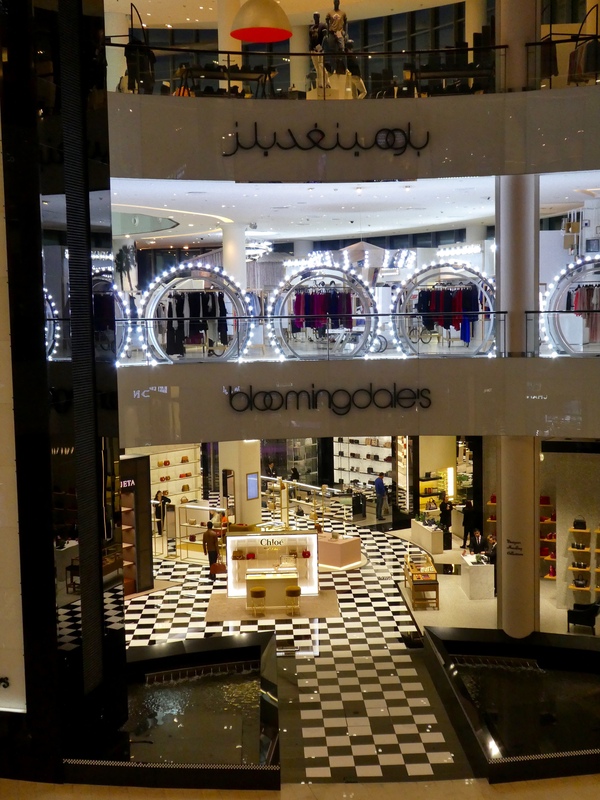 In 2010 Bloomingdales opened their first store outside of the United States, here in the Dubai Mall. This store is huge with three levels of shopping. We love Bloomingdales, but we did not come to the largest mall in the world to shop at stores we have at home. 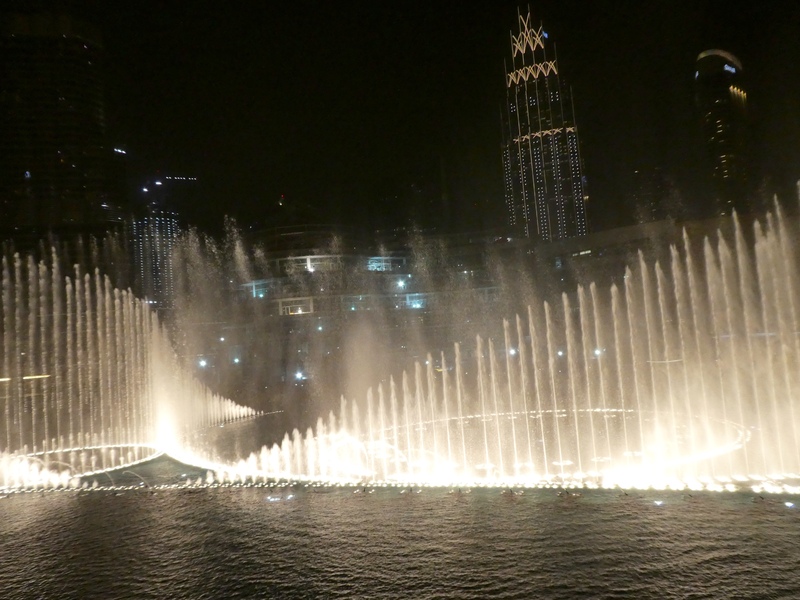 We, Zeb and Chanel, want to see Dubai Fountain. The lagoon here is really big. There are a few fountains and we heard that the fountains dance to music, like they do at the Bellagio in Las Vegas. But this is bigger. 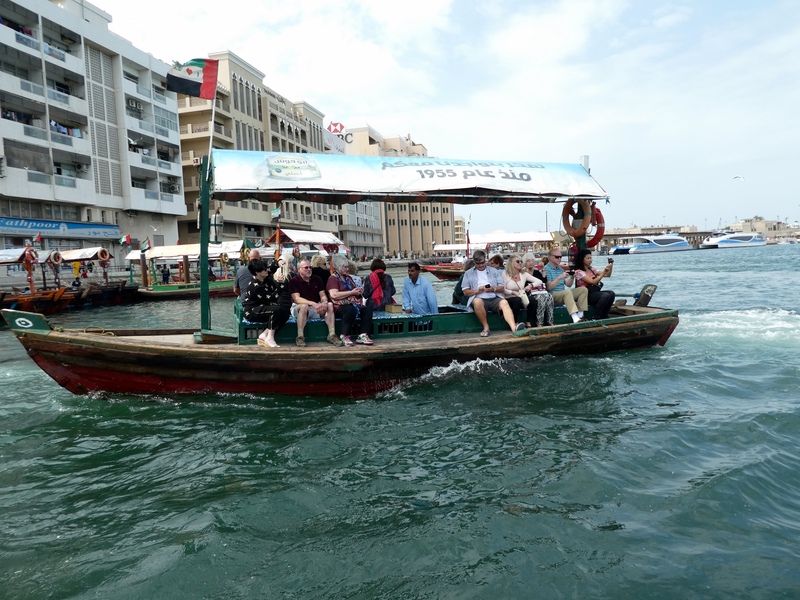 Looking for a place to have dinner and view the water show, we cross the bridge over the lagoon and enter Souk al Bahar. 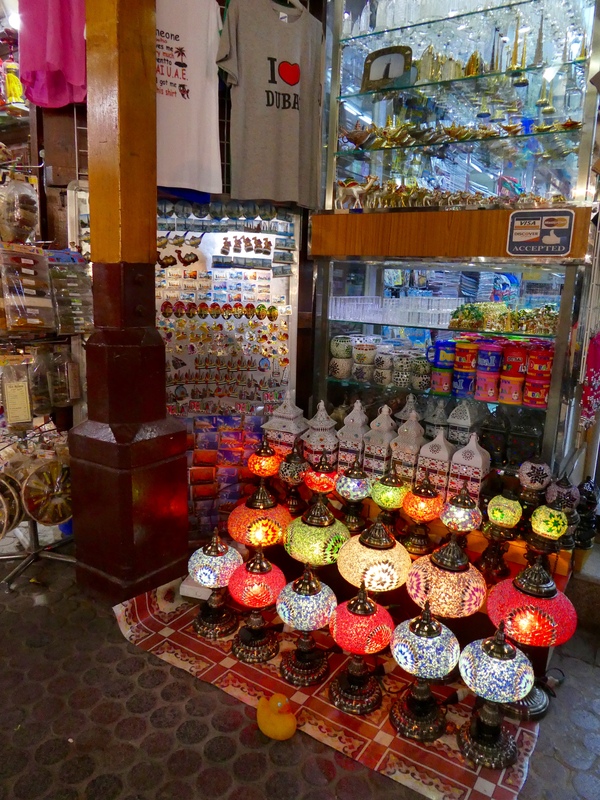 Up to the second floor, expecting a better view, we discovered Abd el wahab, a Lebanese restaurant. Let’s have dinner here. There is a balcony with a magnificent view of the dancing water show. We watched three different shows with different types of music. There is a show every 30 minutes. 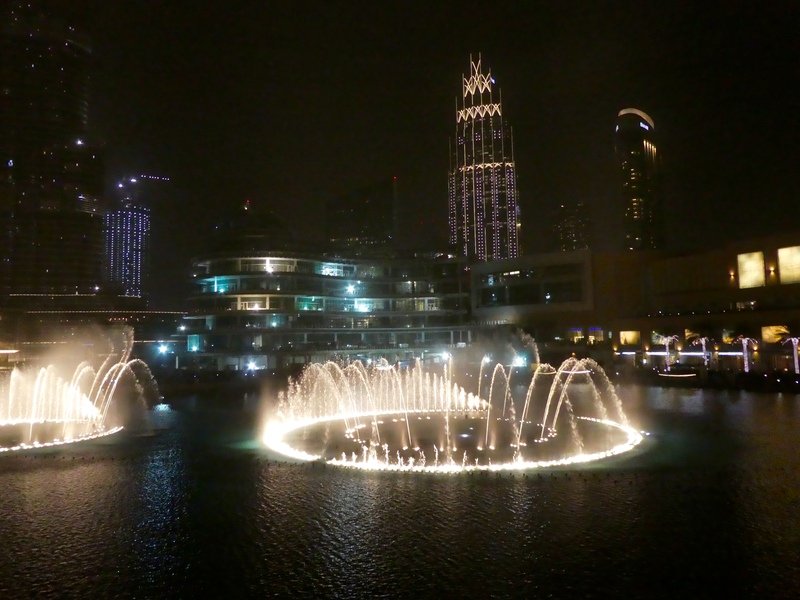 The building behind the Dubai Fountain is Burj Khalifa, the tallest building in the world. But we will show more of that another day. After dinner we return to the mall. 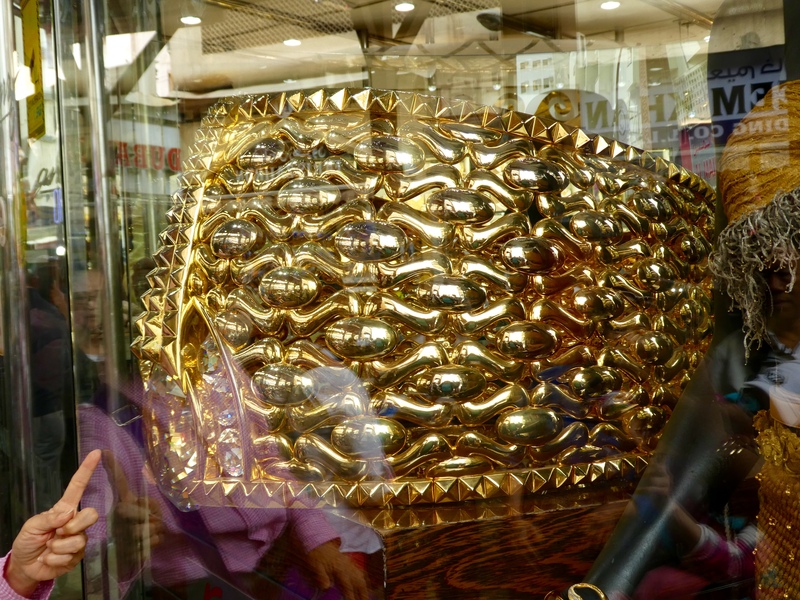 Beautiful inside, isn’t it? 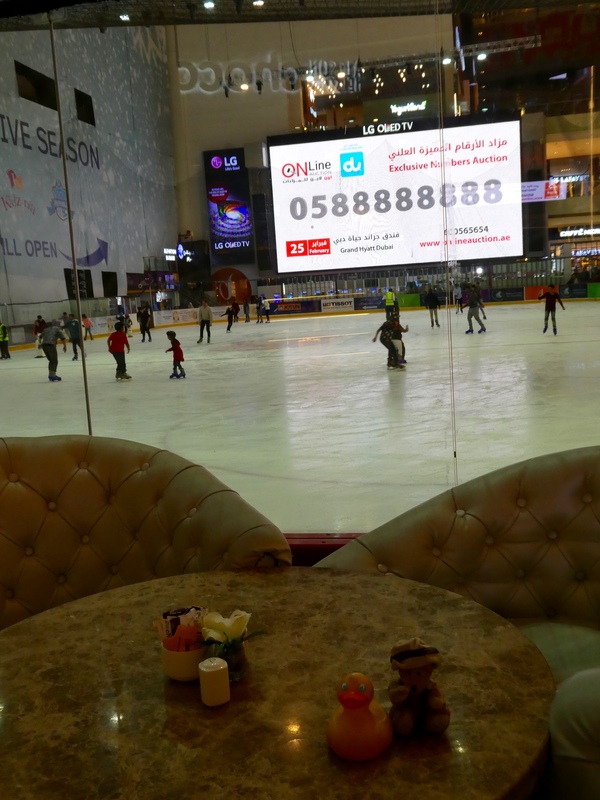 Did you know that this mall has an Olympic size ice skating rink? 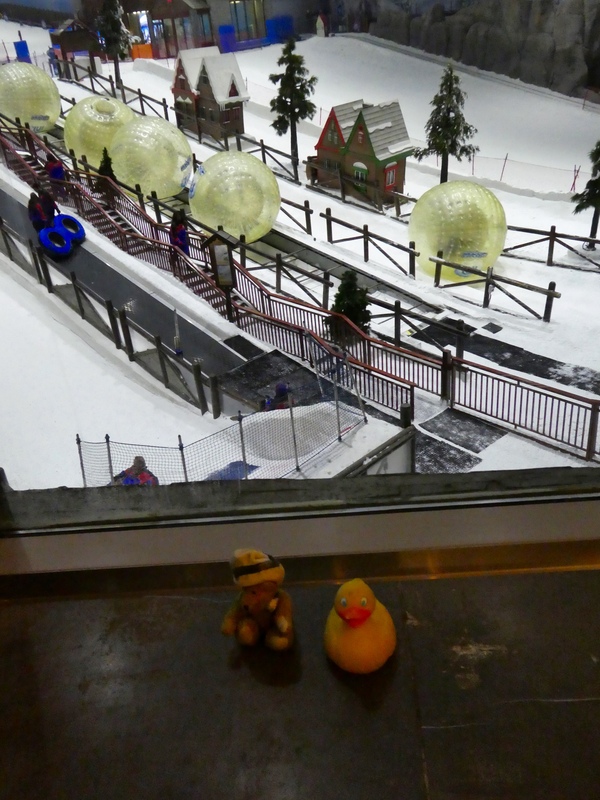 I, Zeb the Duck, and Chanel the Bear, love to watch ice skaters. They seem to move gracefully, as they glide over the ice. But, there is more to see. 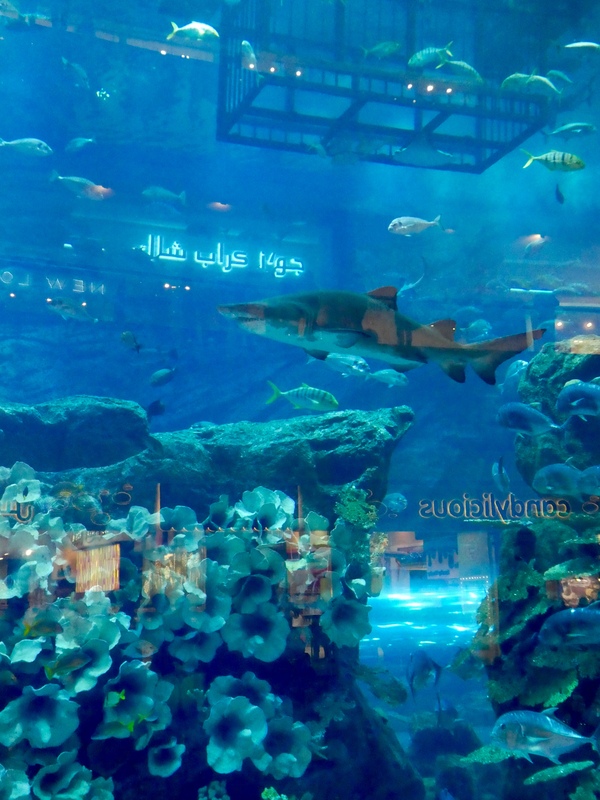 A huge aquarium is also inside Dubai Mall. 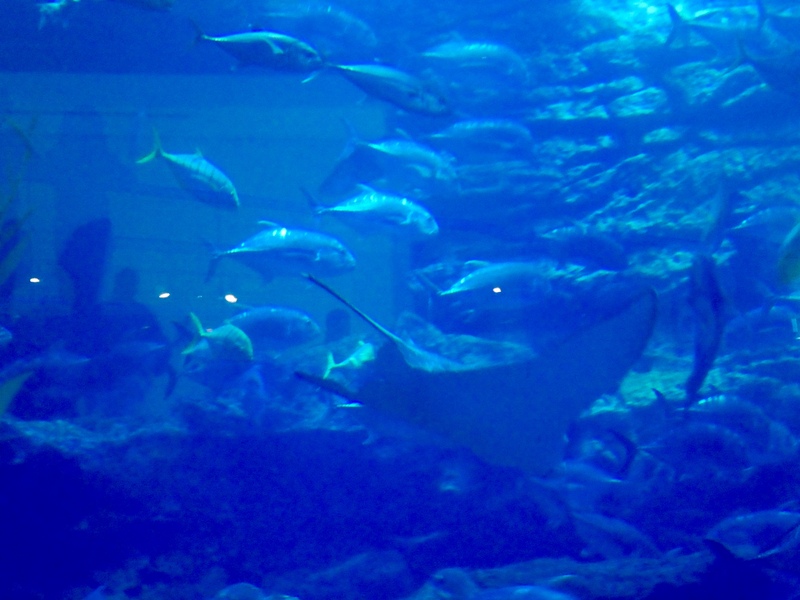 We did not even go inside the aquarium, this is what we saw from the mall. 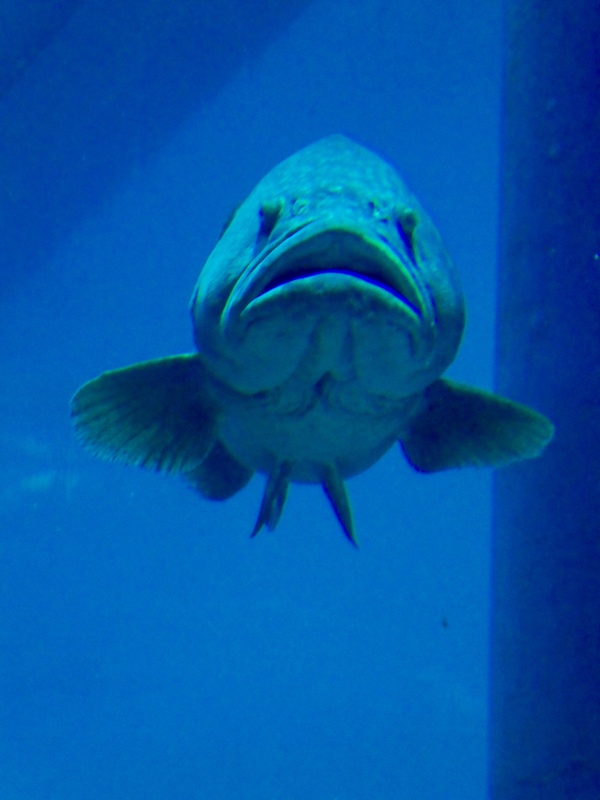 It is nice that humans, ducks and bears can see so much of the aquarium while shopping and wandering around the mall. They don’t have to take the time to go inside the aquarium. We can see the stores and reflections of lights through the aquarium. But we heard that inside is spectacular, so if you have time, check it out. 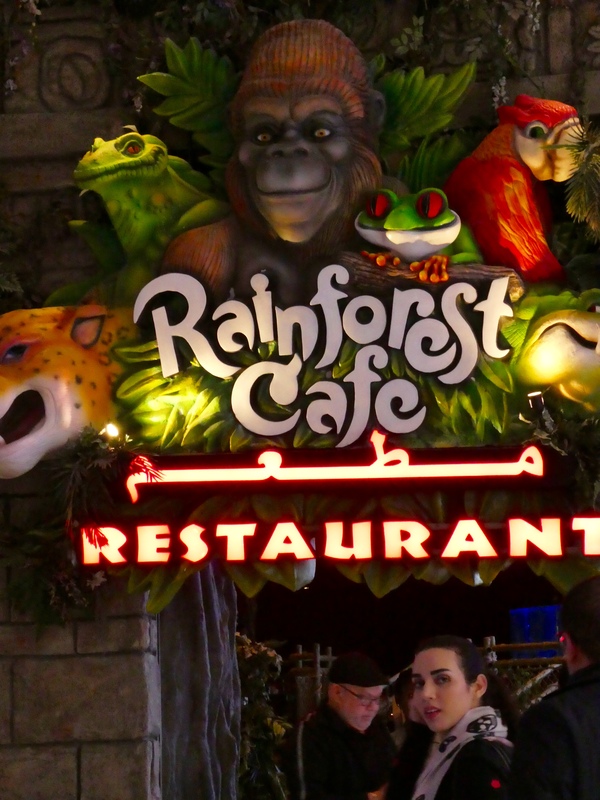 Oh, if we had not just eaten, we would want to go here, to the Rainforest Cafe. We love the Rainforest Cafe and the one in Denver is closed. 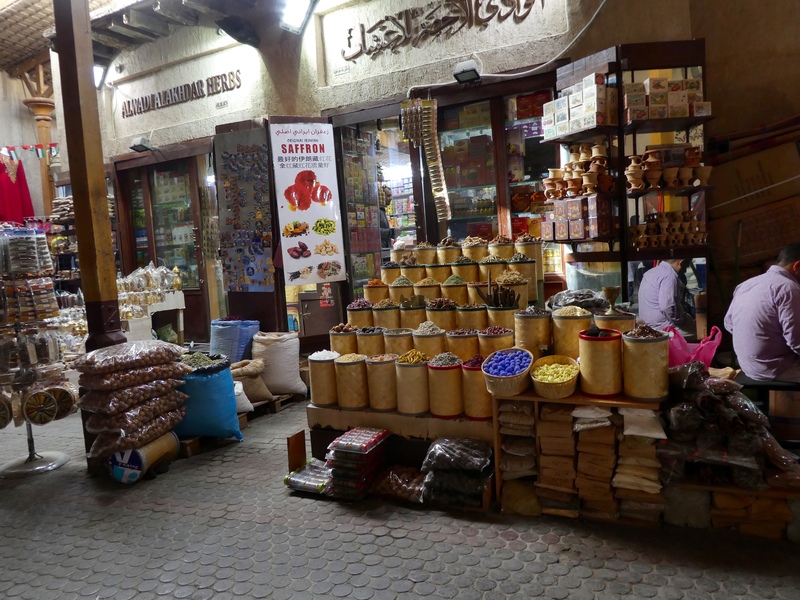 But we enjoyed our Lebanese restaurant, and we came to Dubai to have new experiences. We are happy humans, duck and bear. 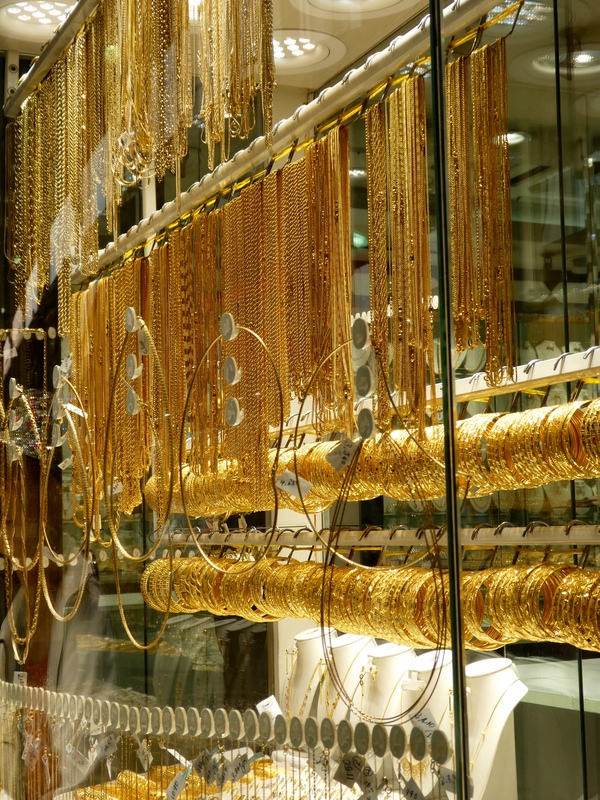 When in Dubai, we hope you take time for a visit to Dubai Mall. It is a great place.